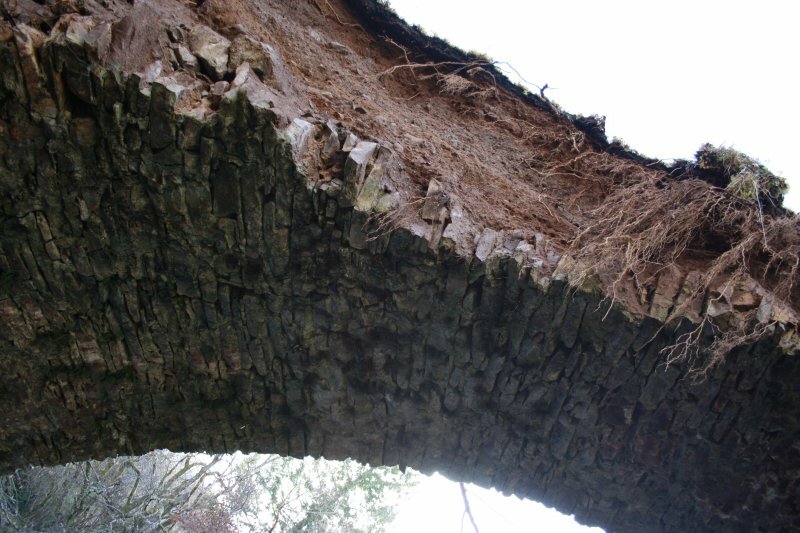 View of the underside of the arch. 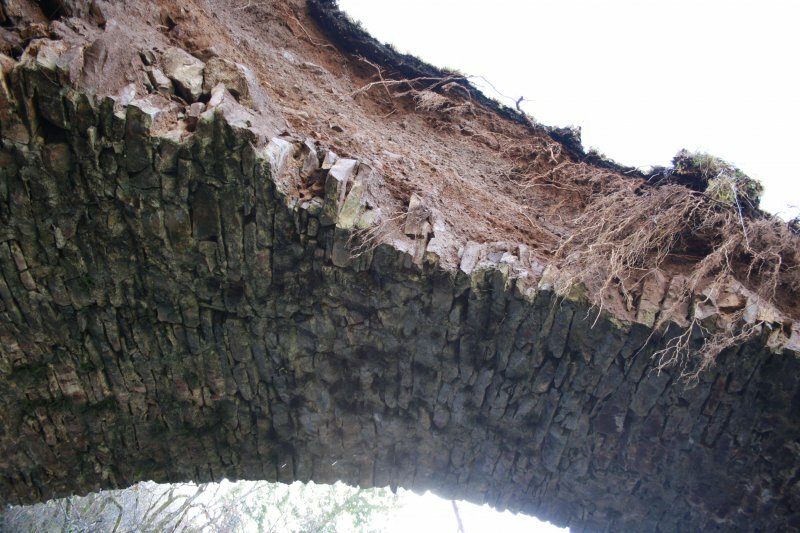 View of the underside of the arch from NW. 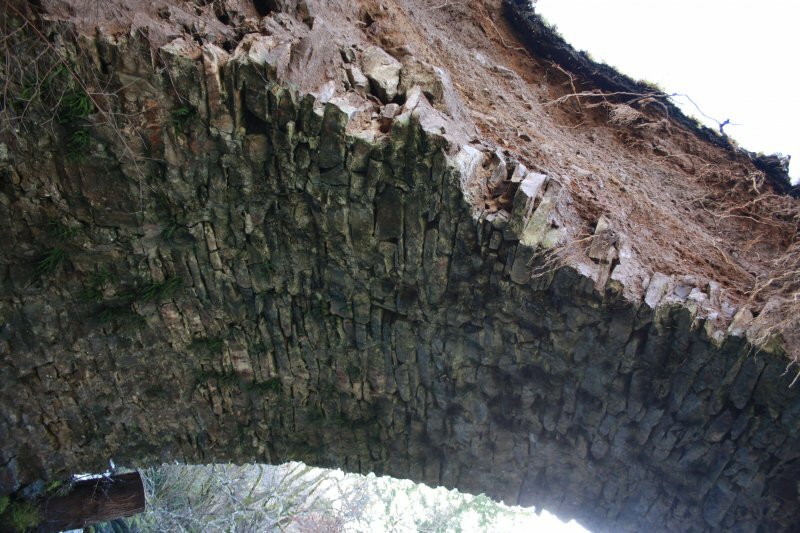 View of the underside of the arch from SW.
View of the arch from the NW. 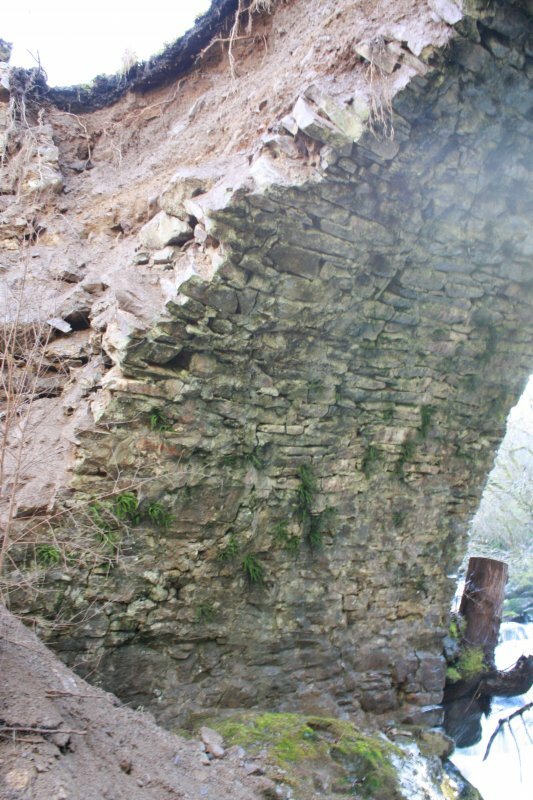 View showing W-facing elevation and recent collapse of the bridge. 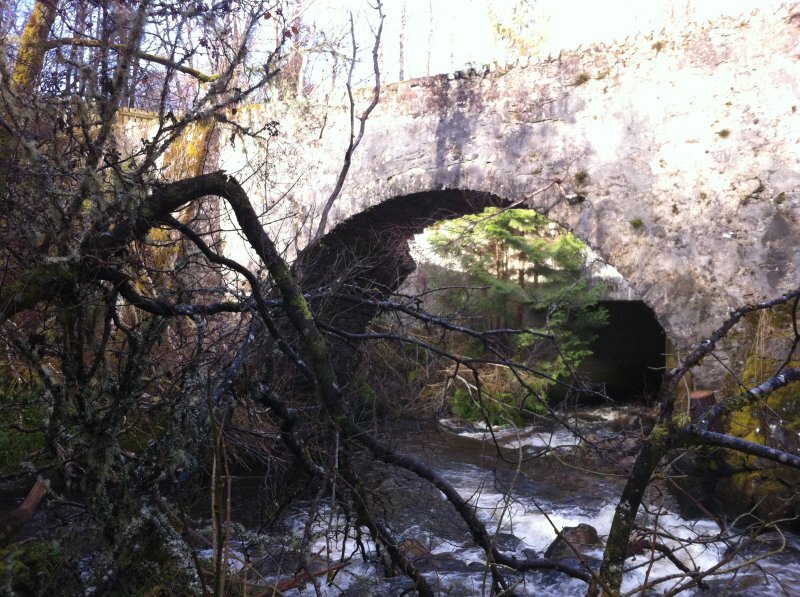 General view of the bridge from the NW. 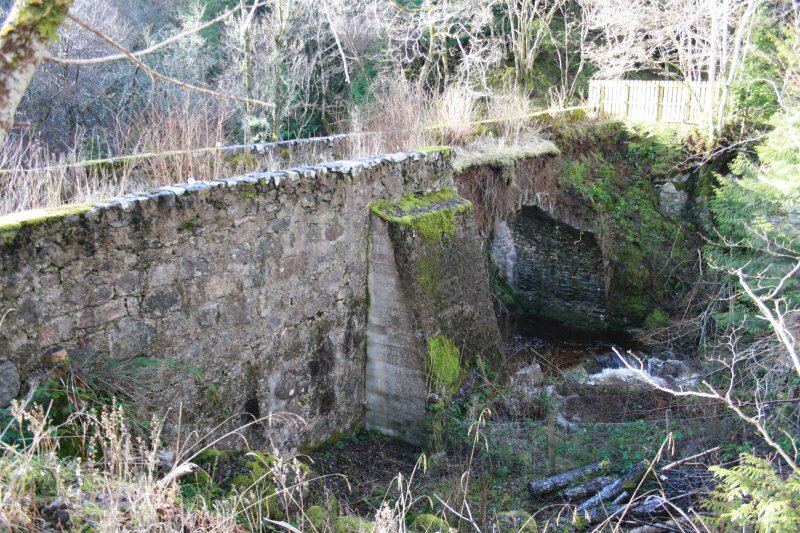 General view of the bridge, showing E-facing elevation. 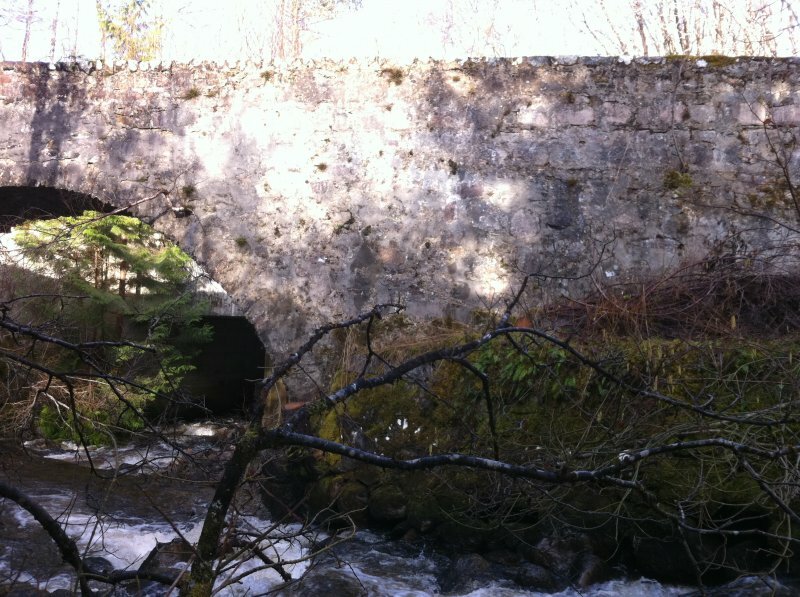 General view of the bridge, showing fence blocking access to bridge. 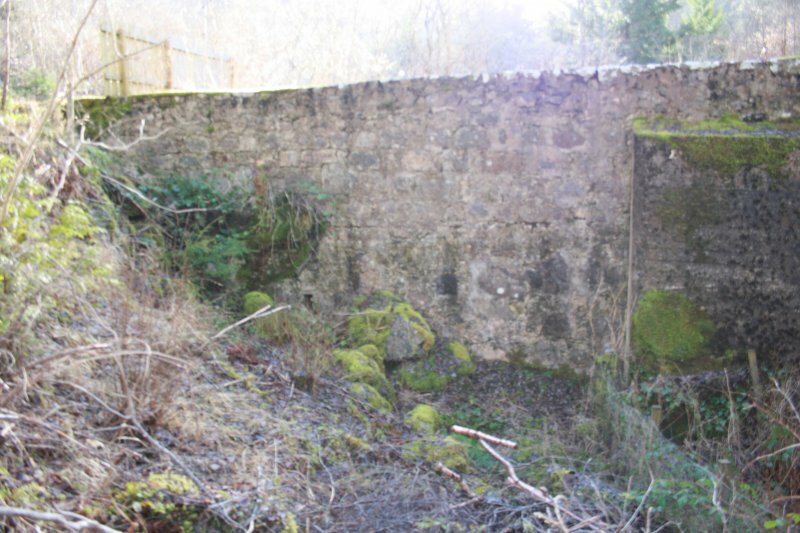 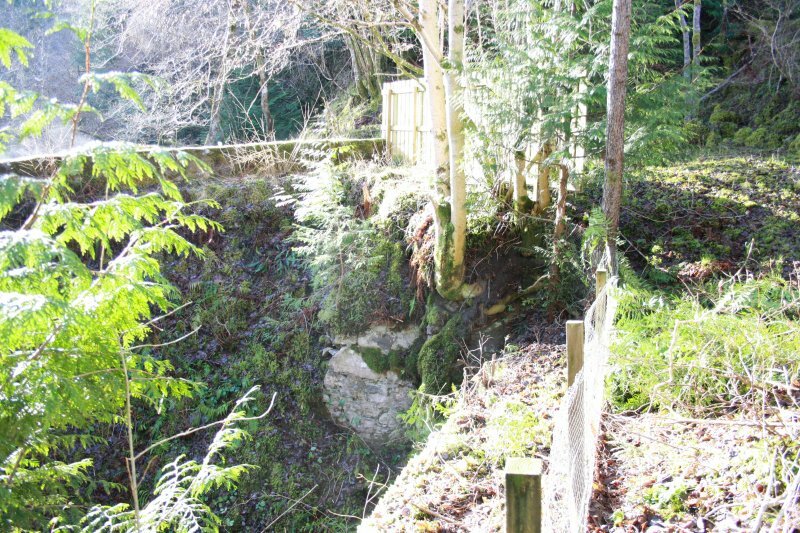 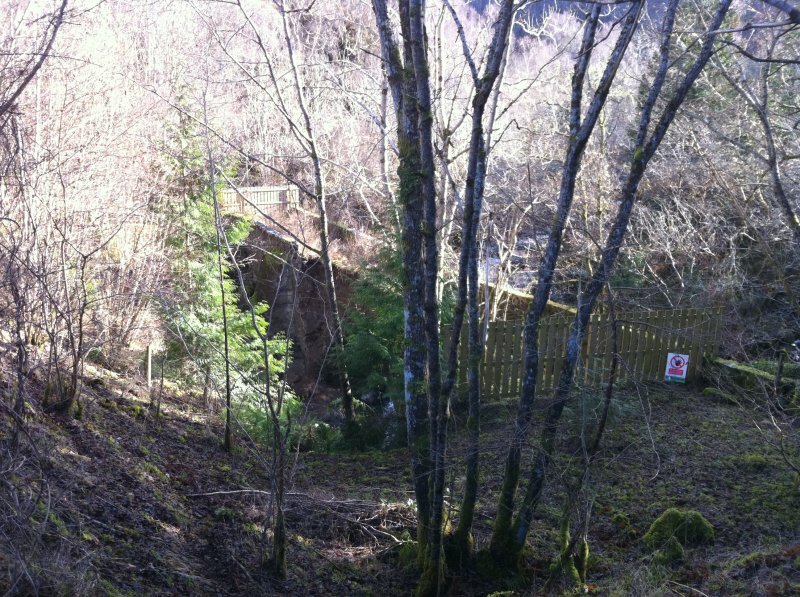 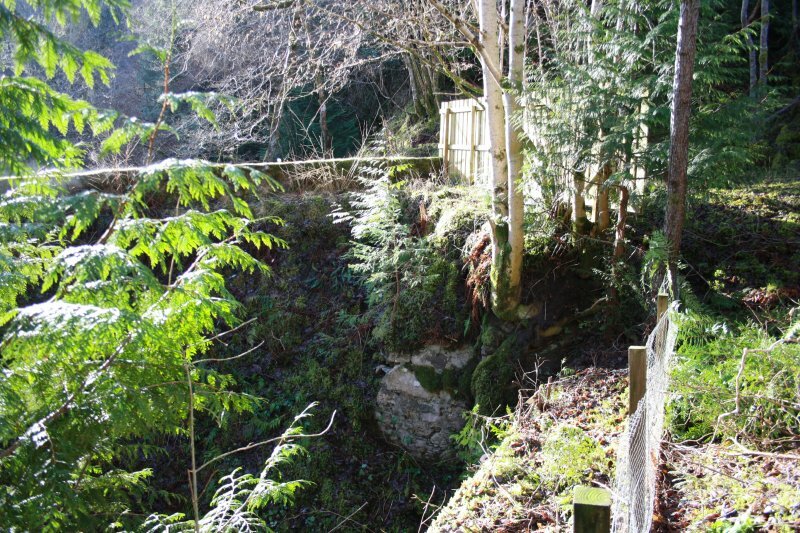 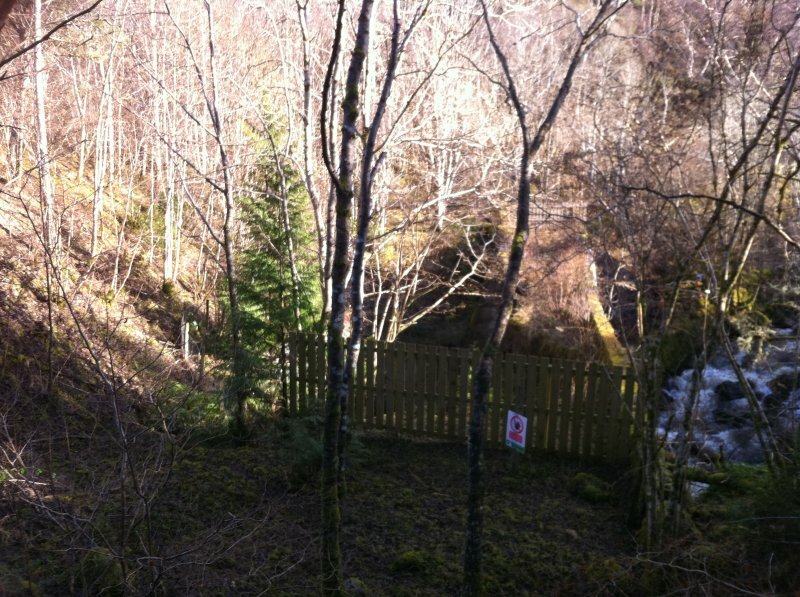 View showing fencing blocking access to the bridge. 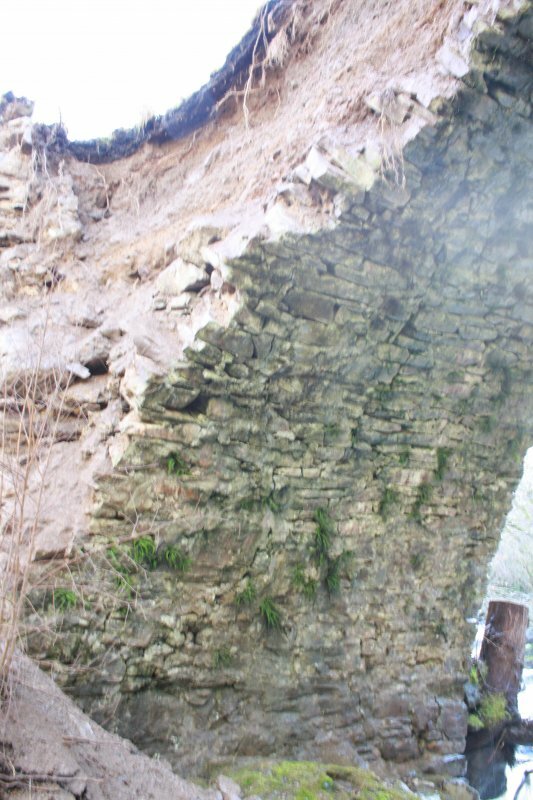 View of the arch from the SW.
View of the E-facing elevation. 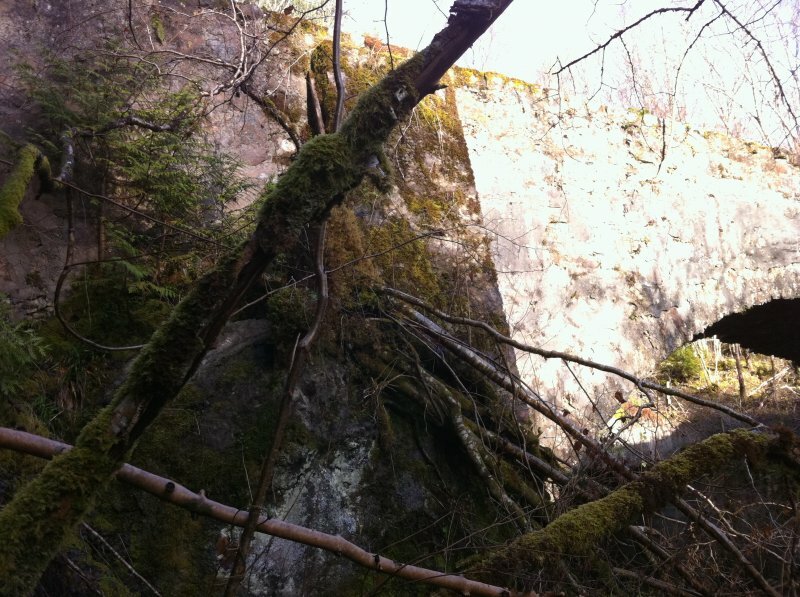 View of the SE buttress from the NE. 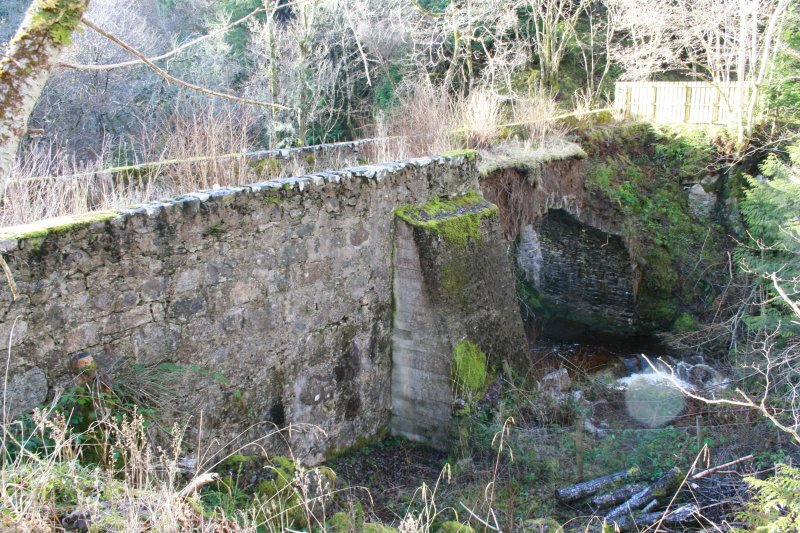 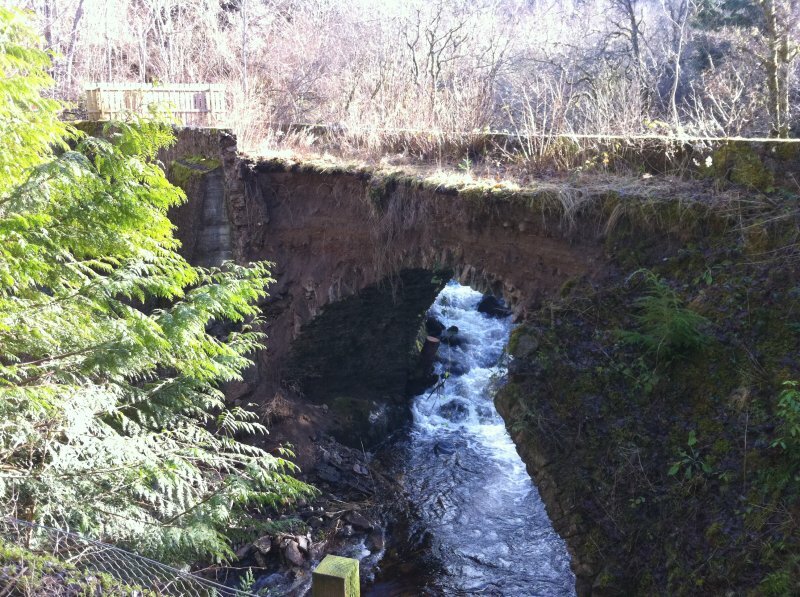 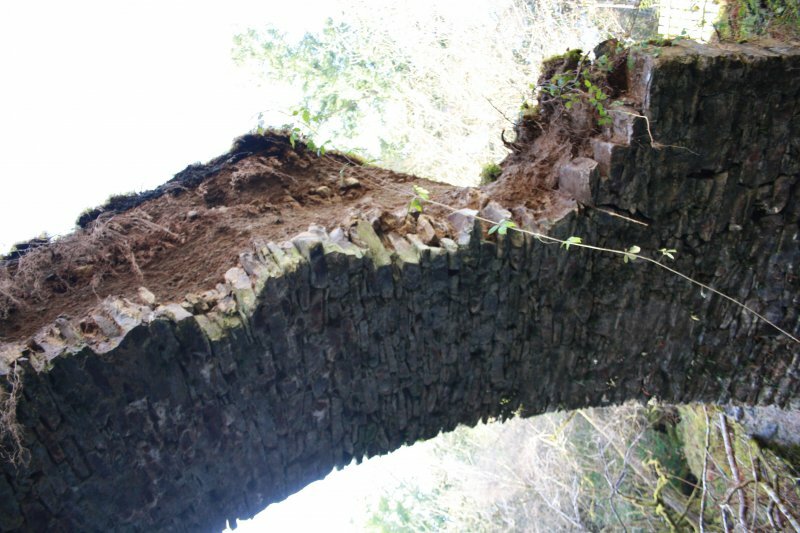 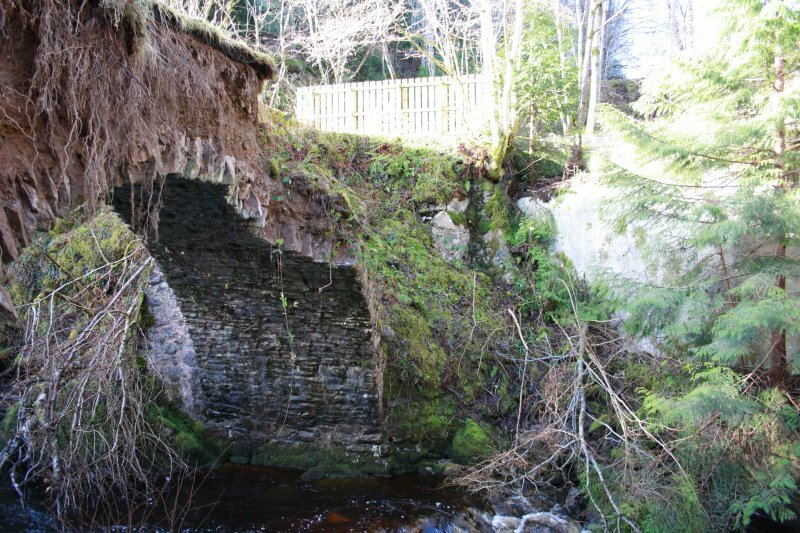 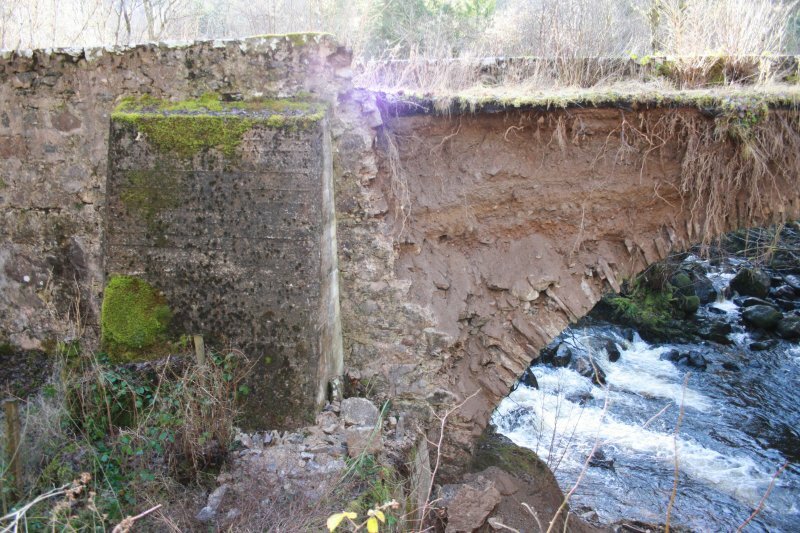 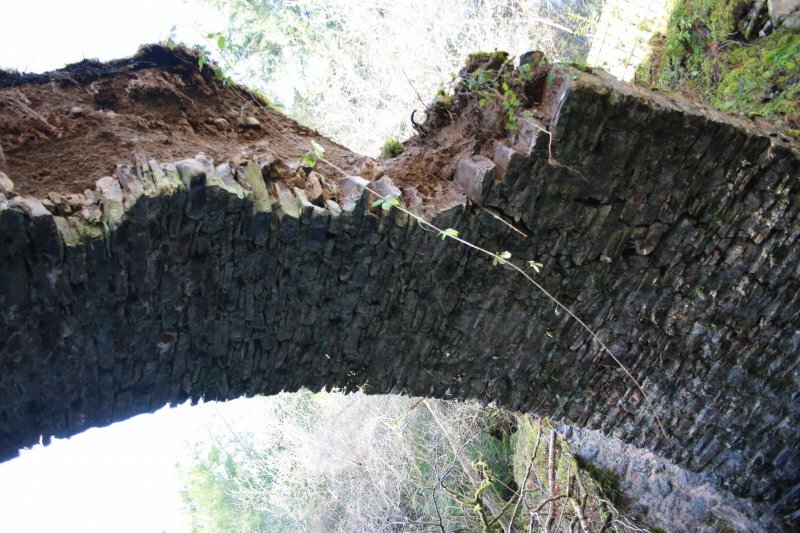 General view of the bridge, showing recent collapse on w-facing elevation. 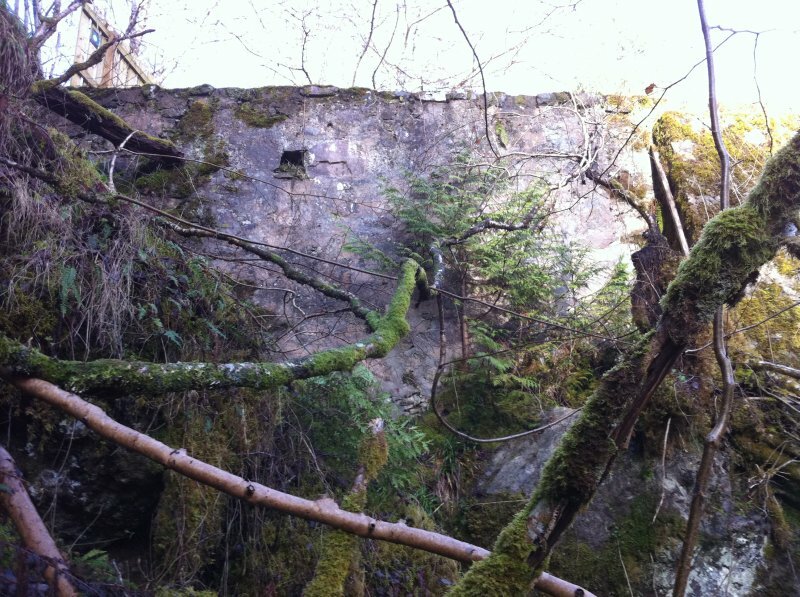 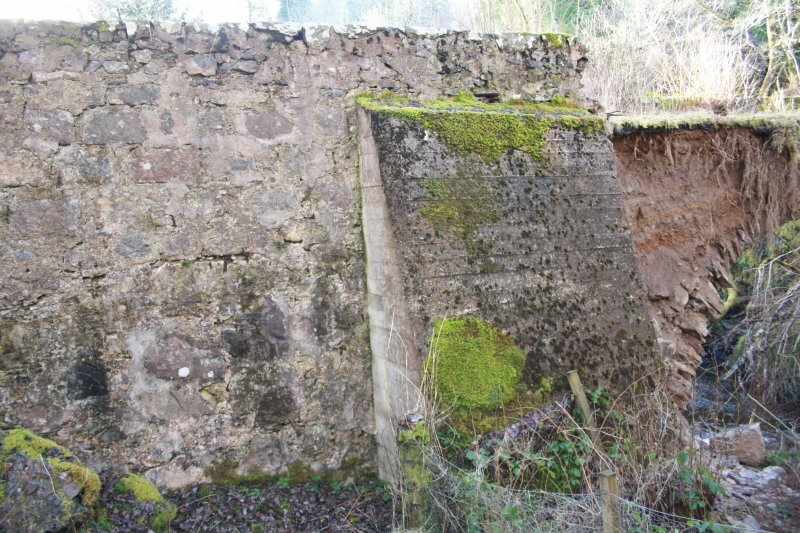 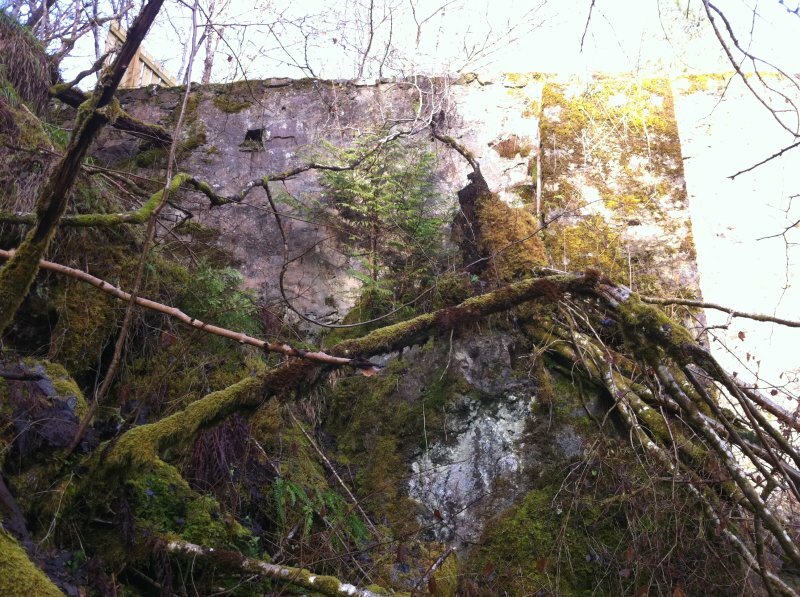 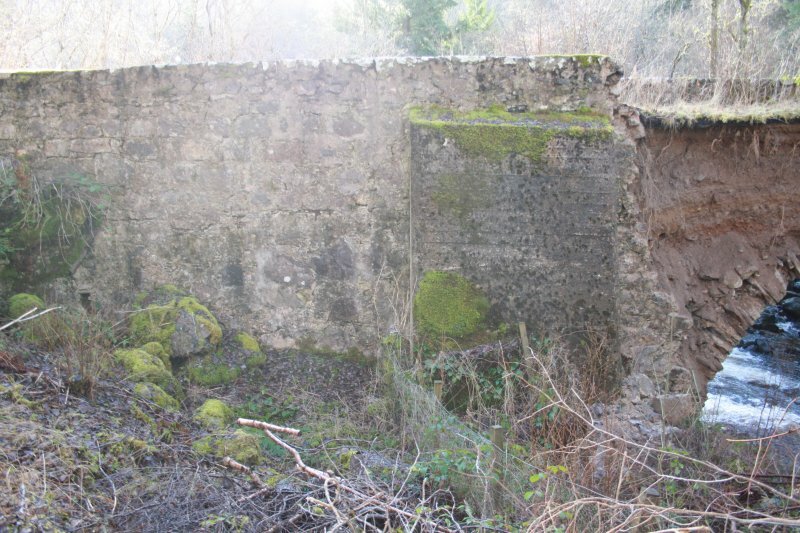 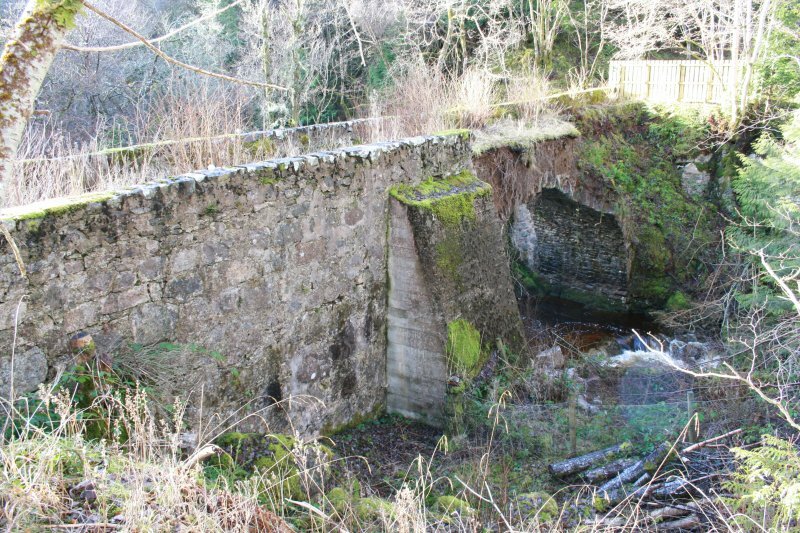 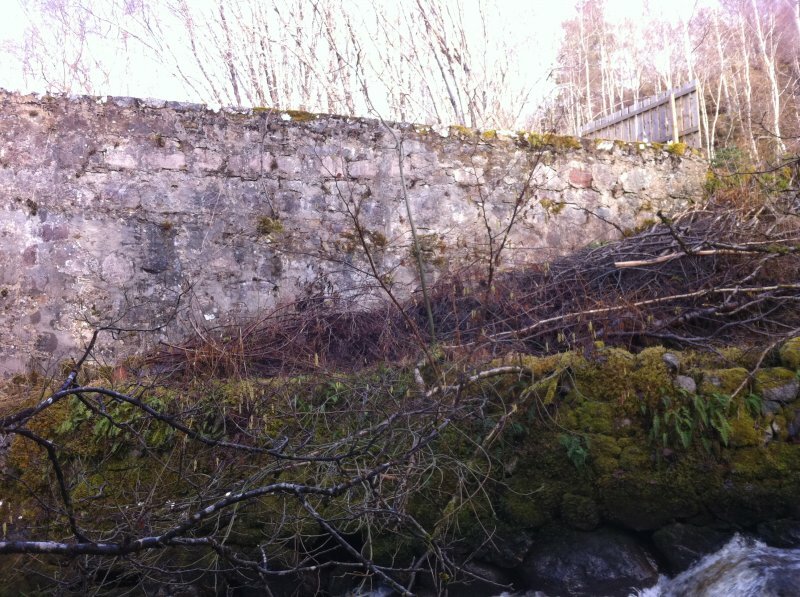 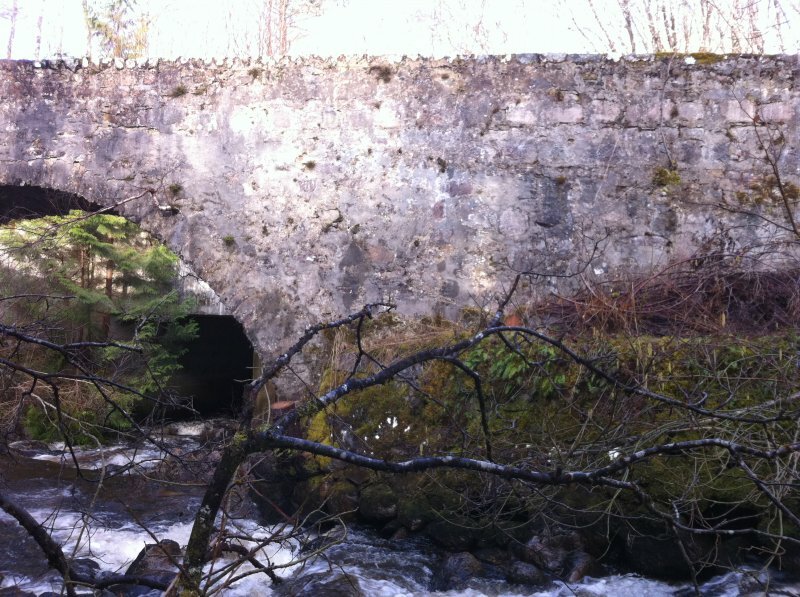 View showing W-facing elevation, buttress and recent collapse of the bridge. 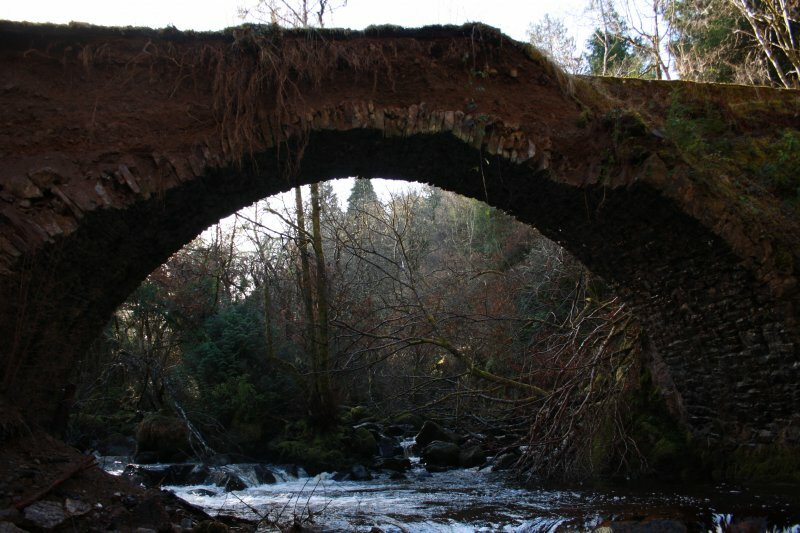 General view of the arch from the SE. 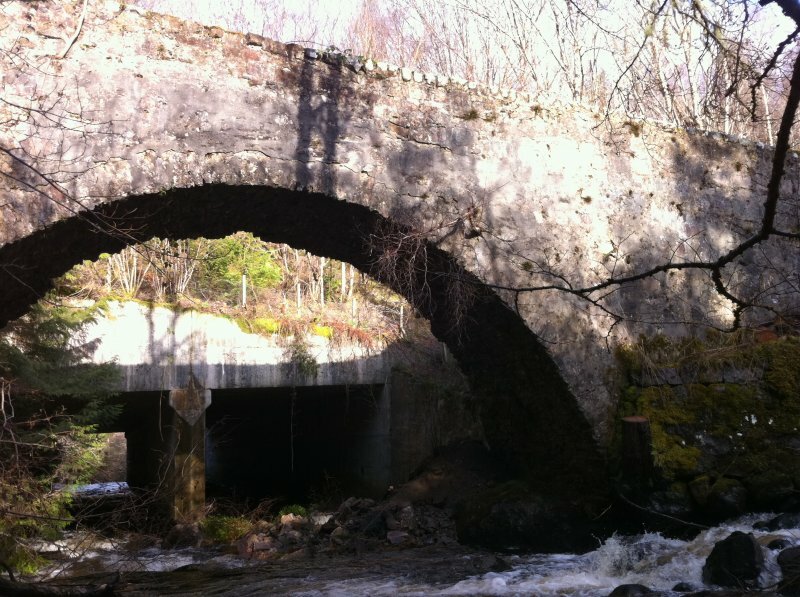 For successor and present bridge, see NH52SW 35. 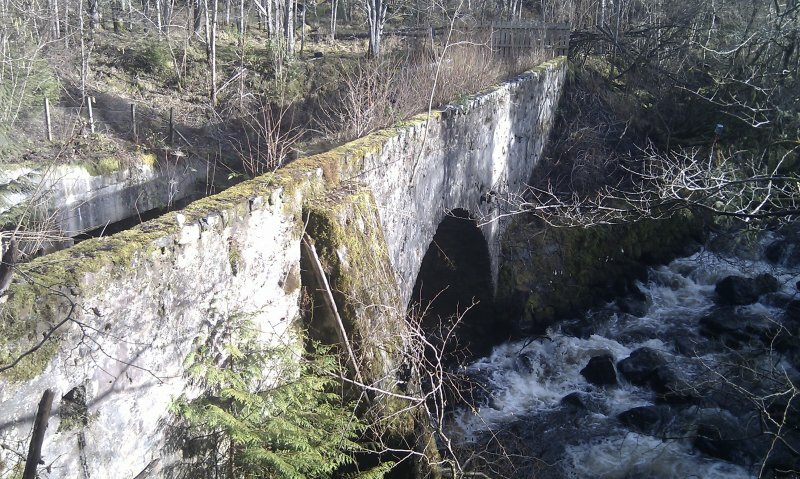 Inverfarigaig Bridge was built in 1732 (see NH52SW 11). 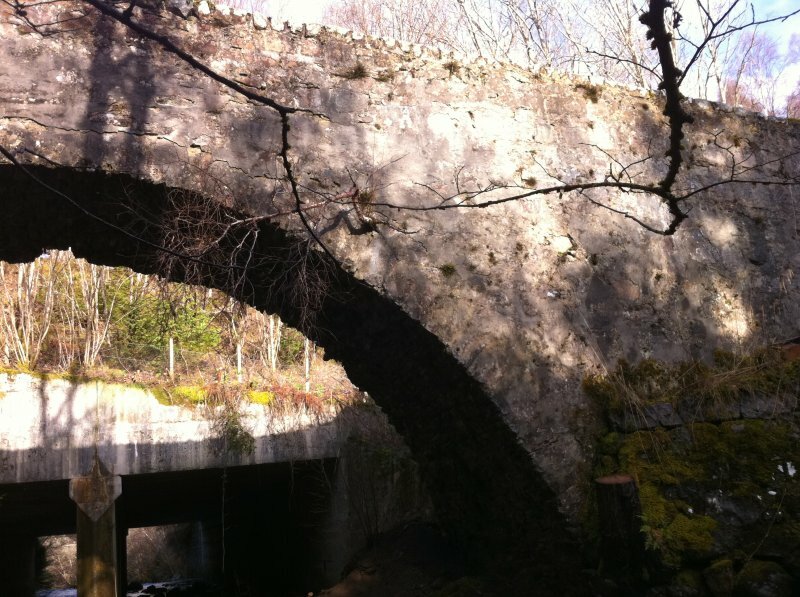 It is a single span 2.8m wide. 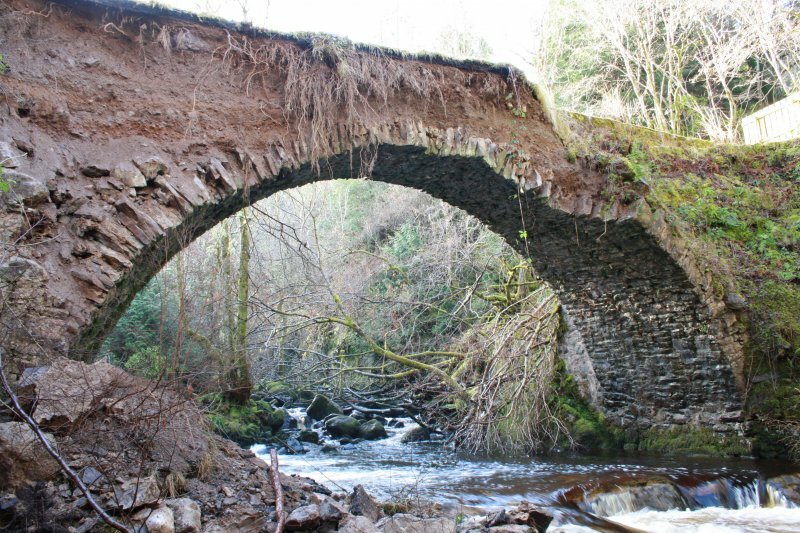 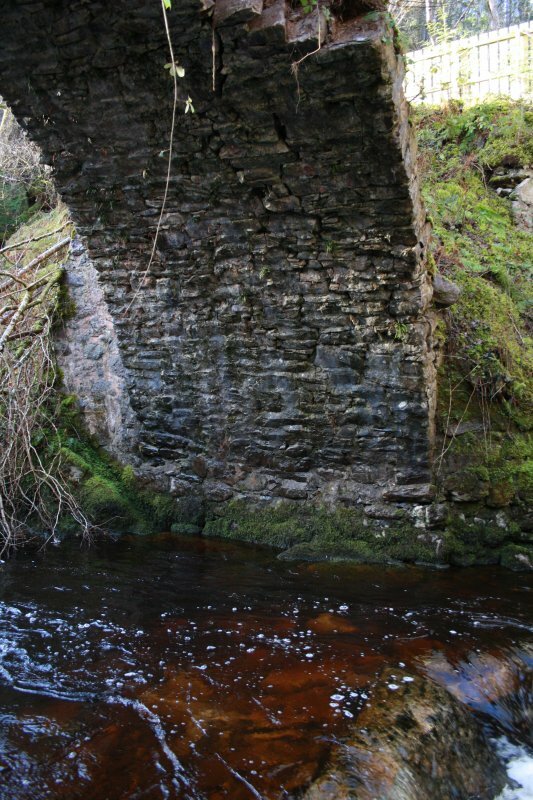 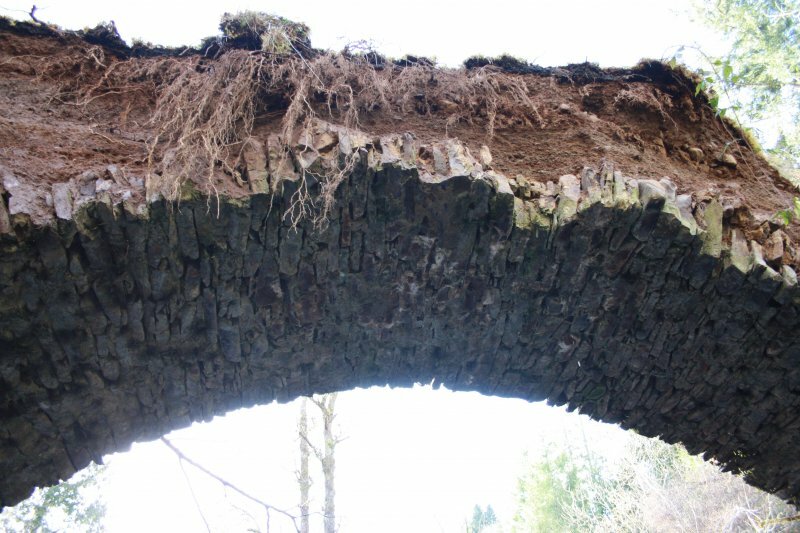 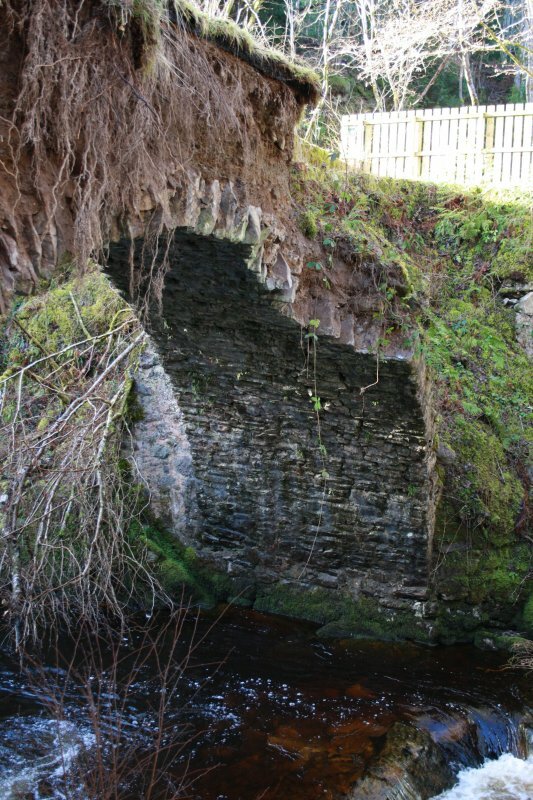 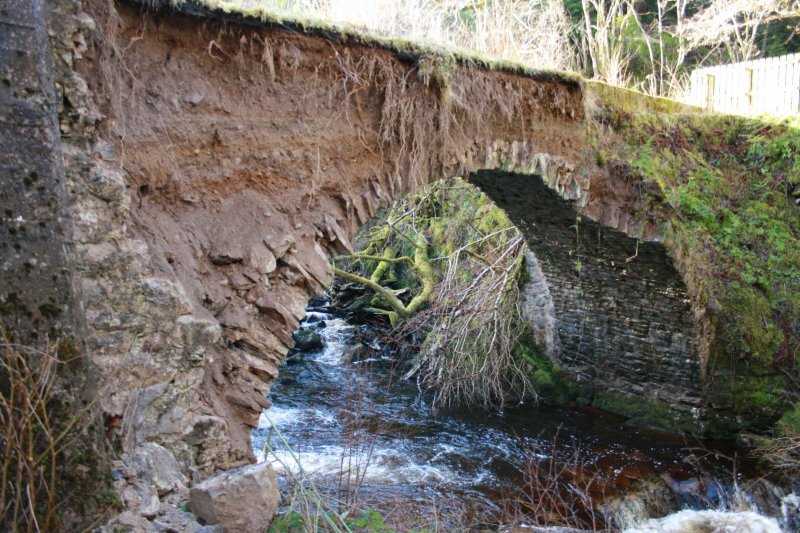 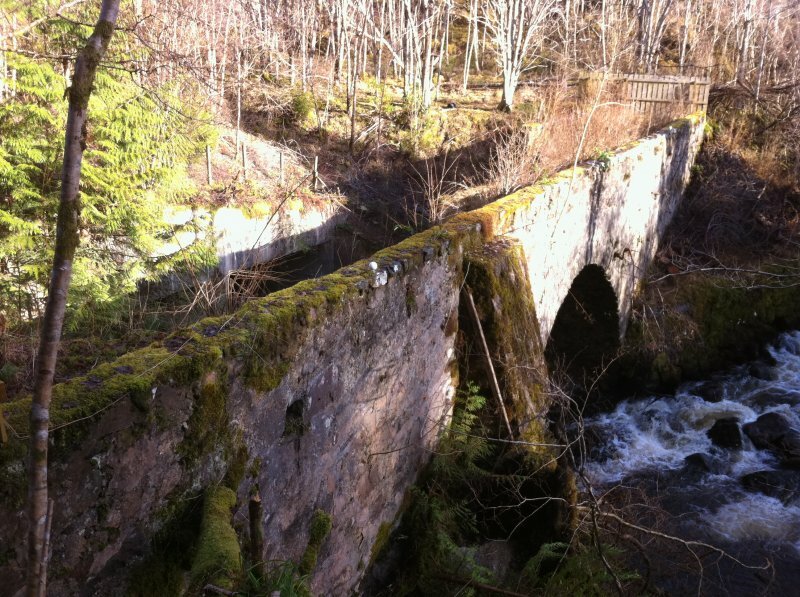 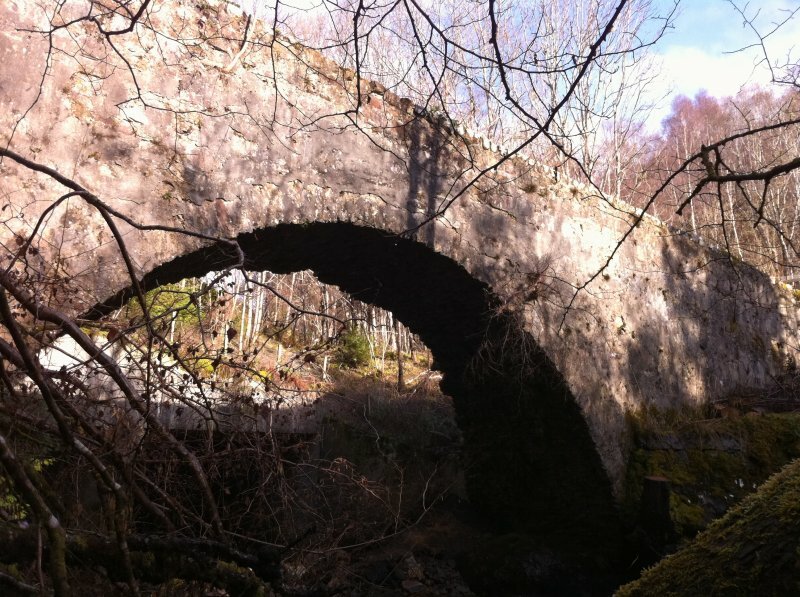 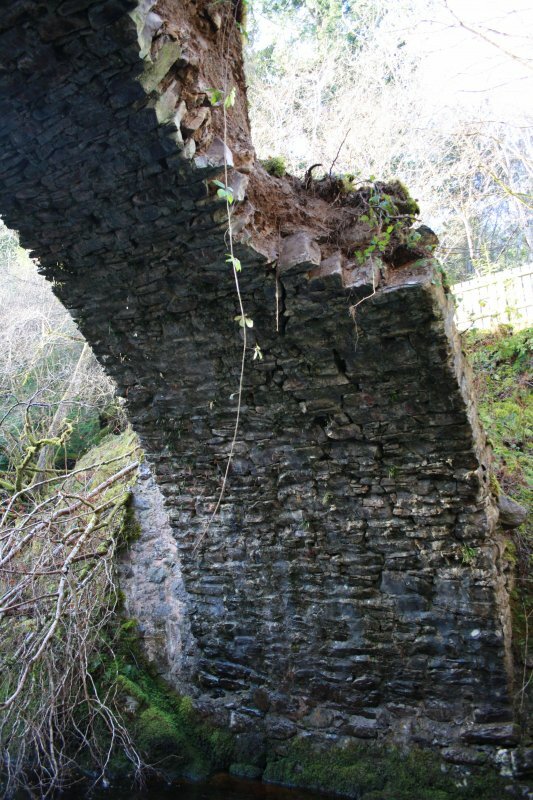 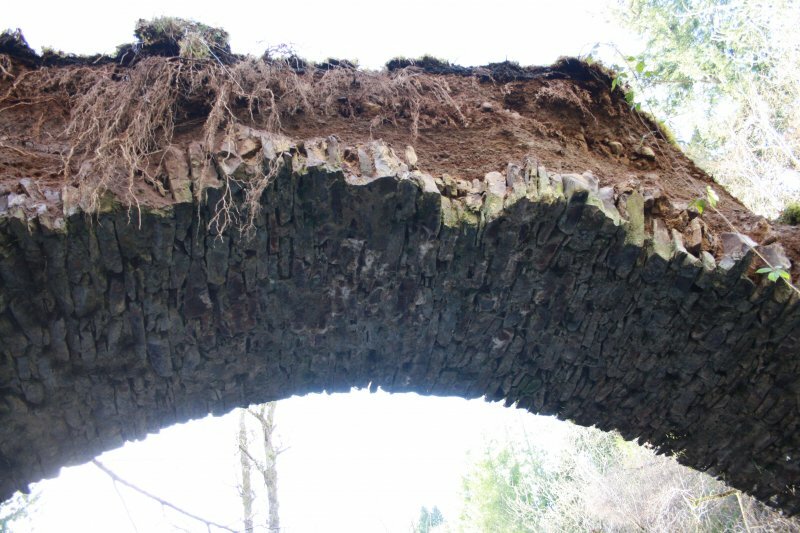 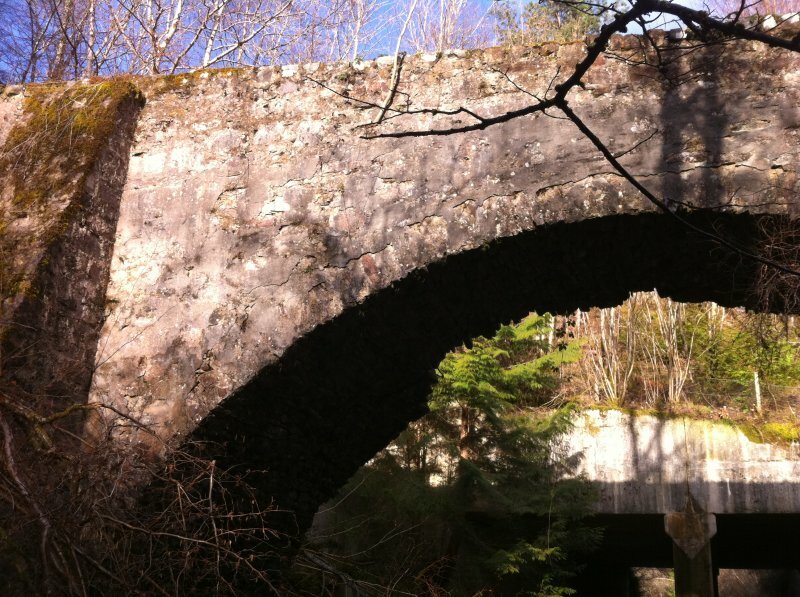 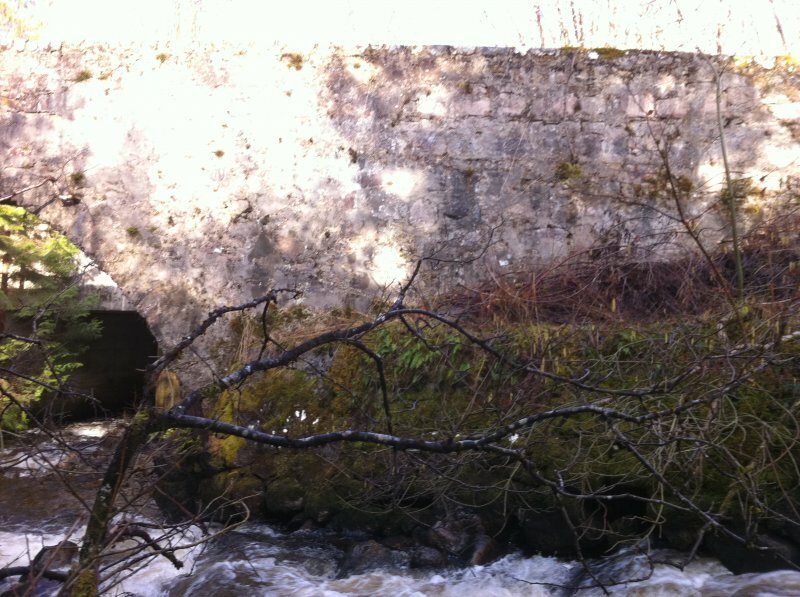 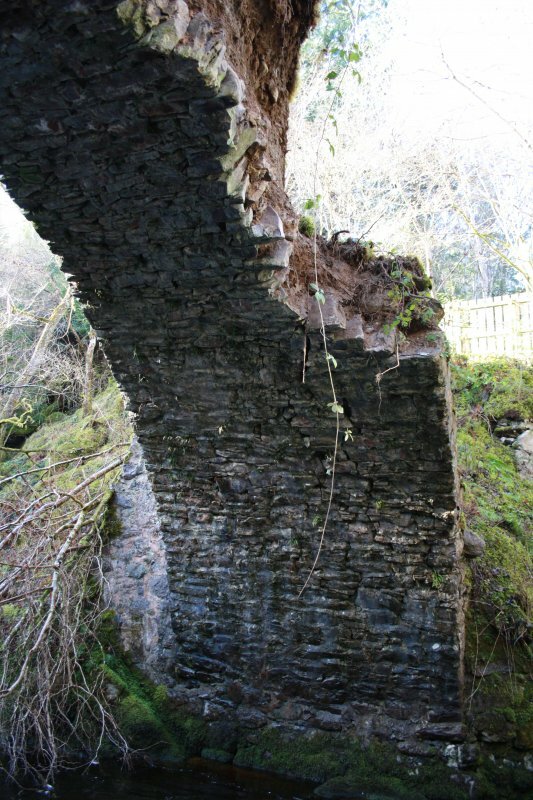 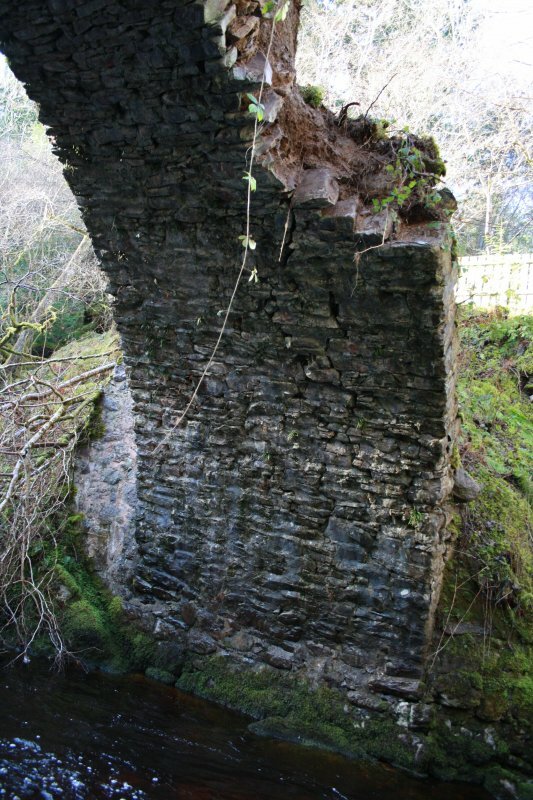 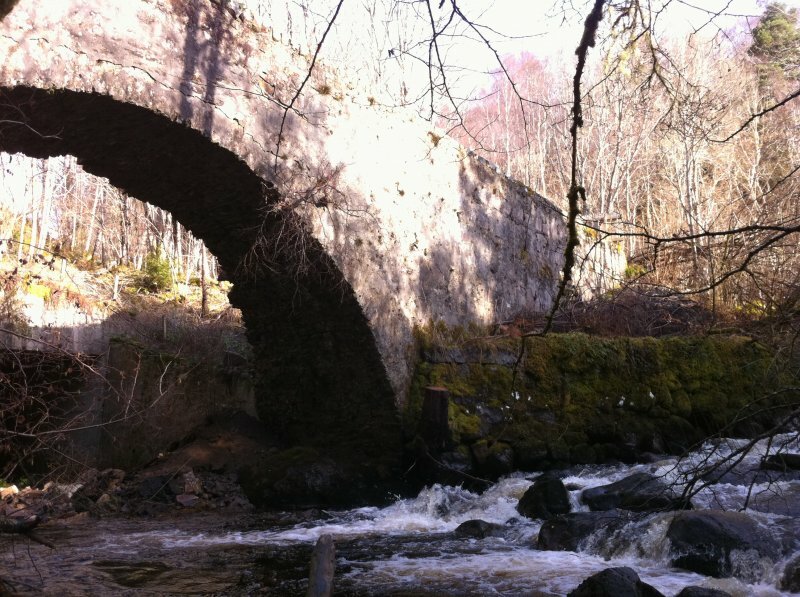 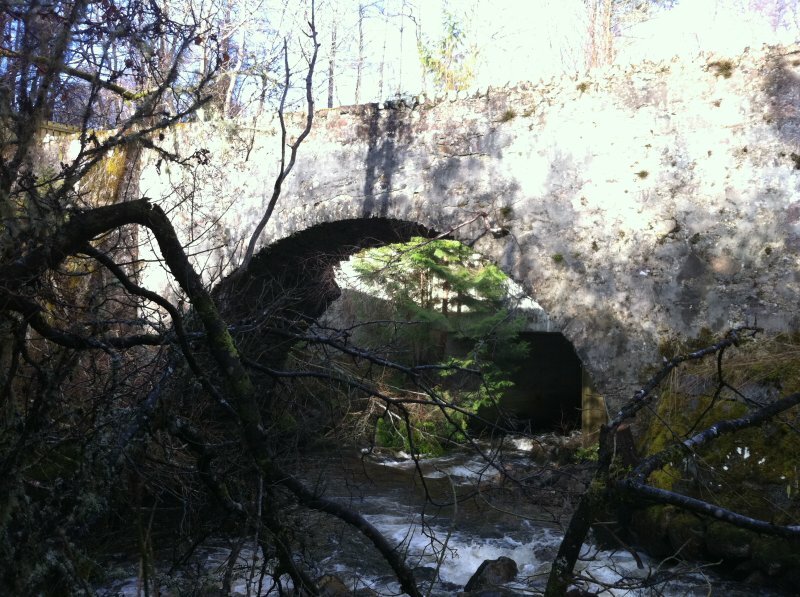 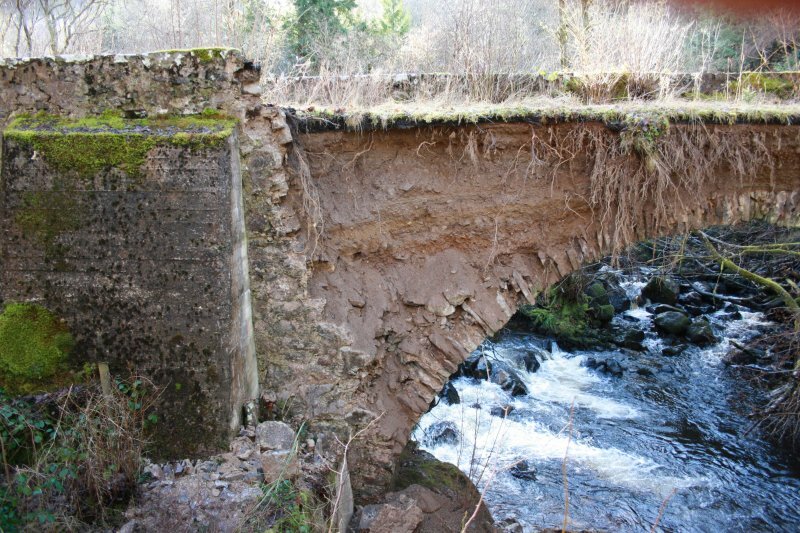 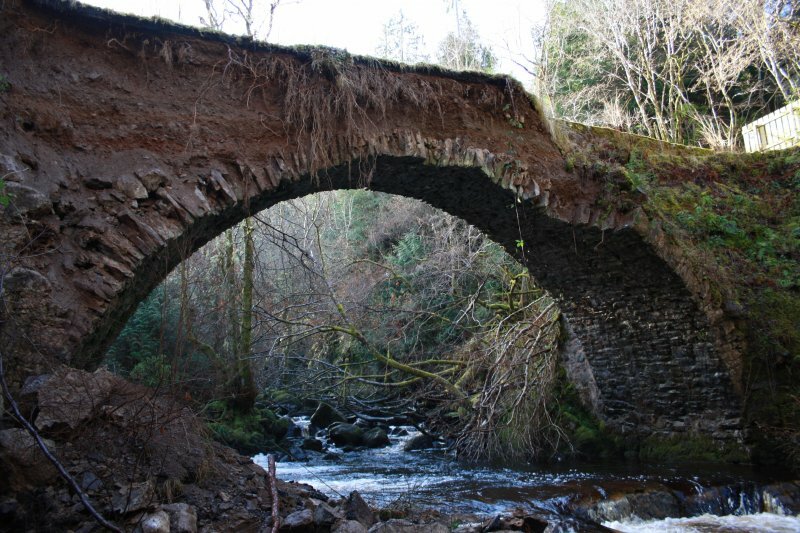 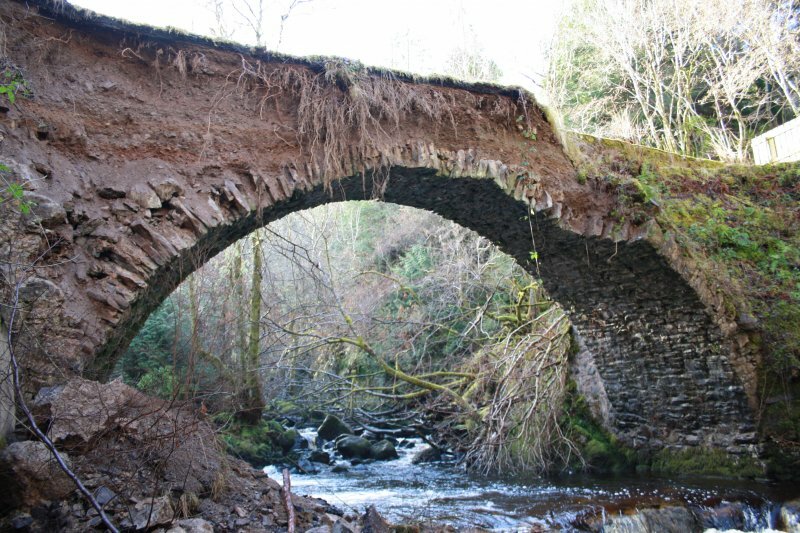 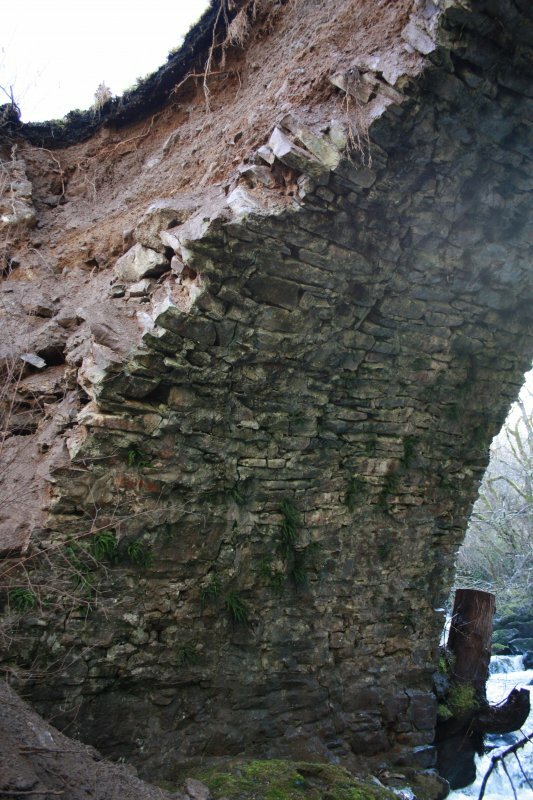 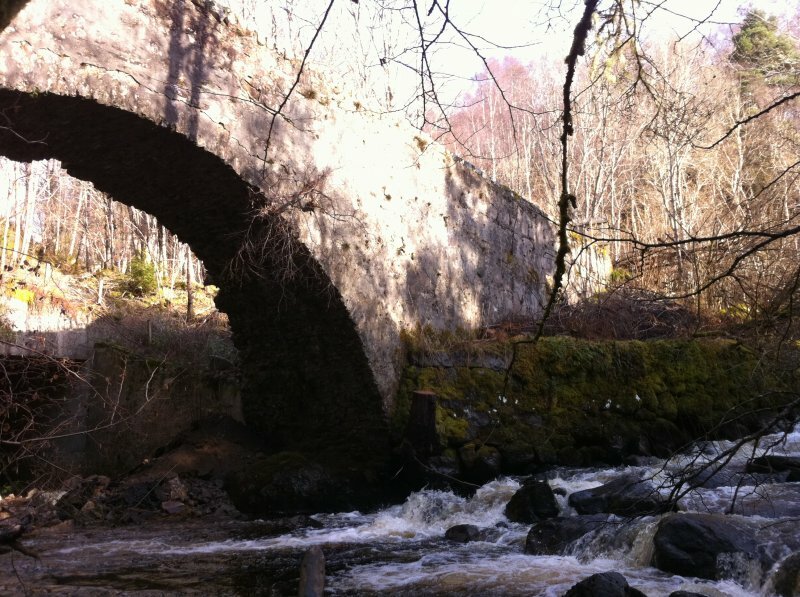 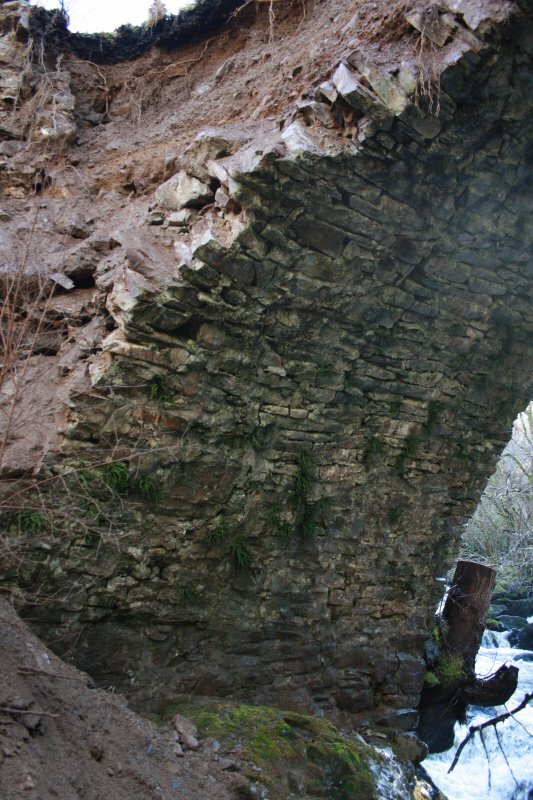 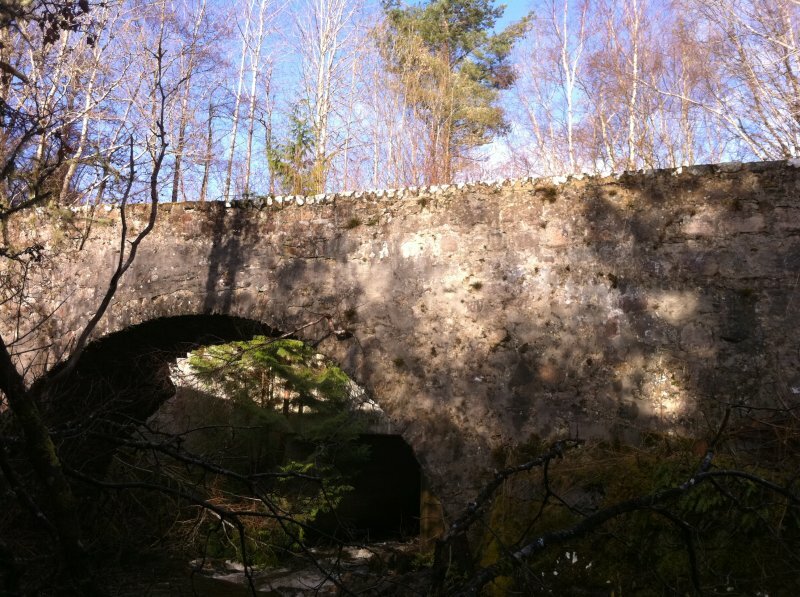 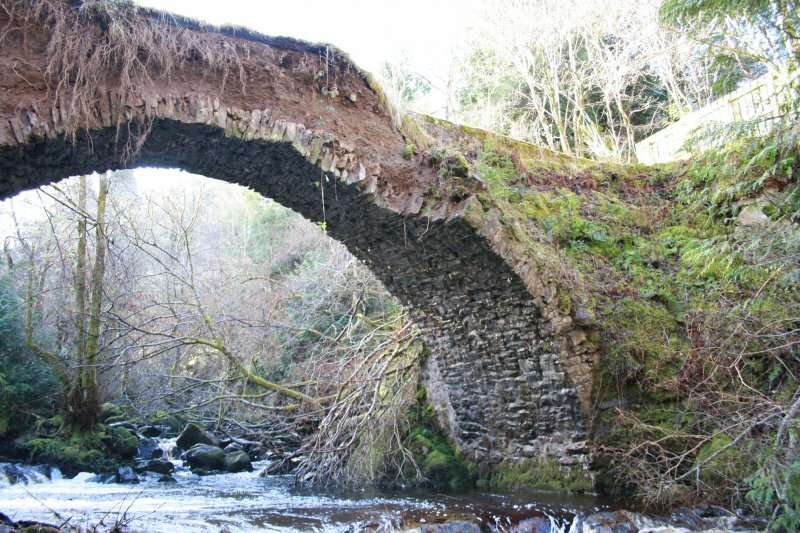 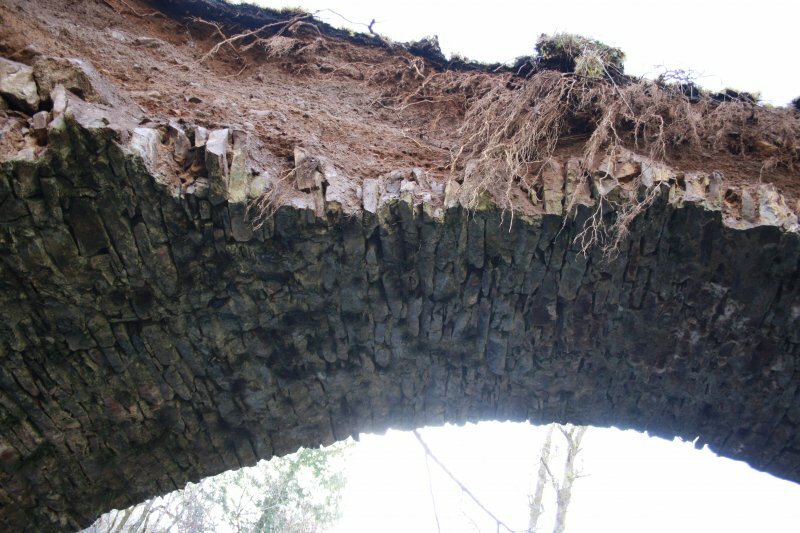 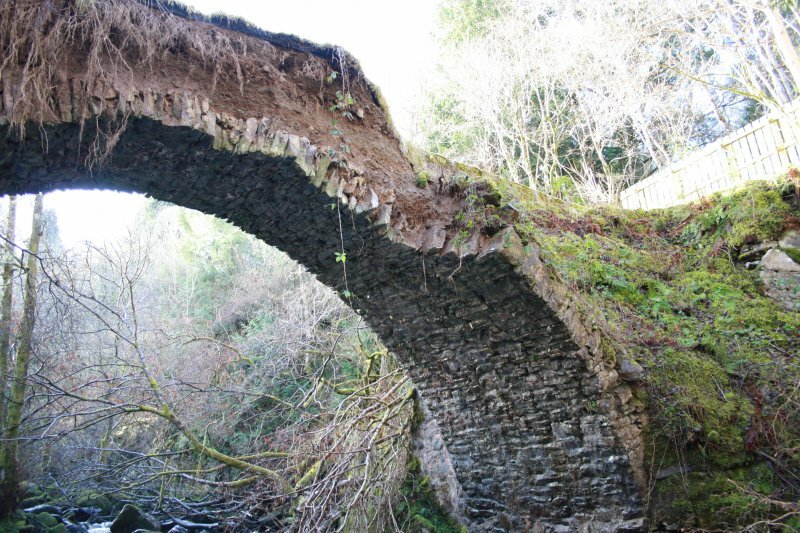 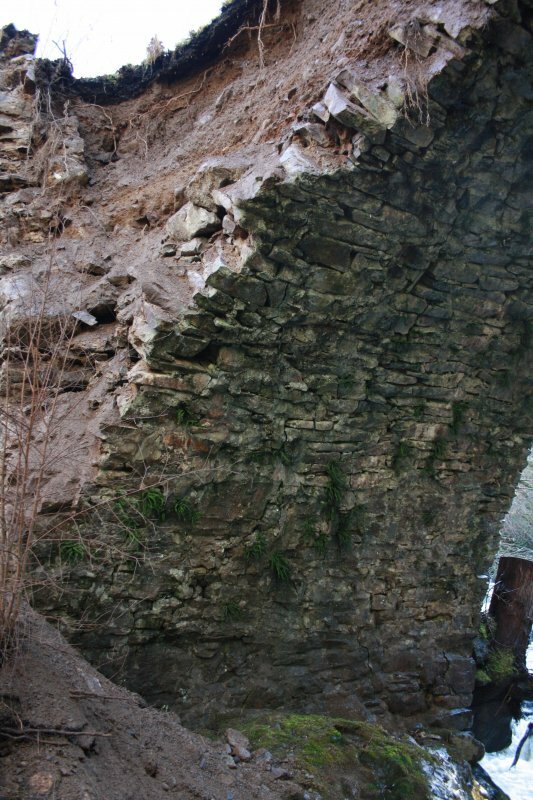 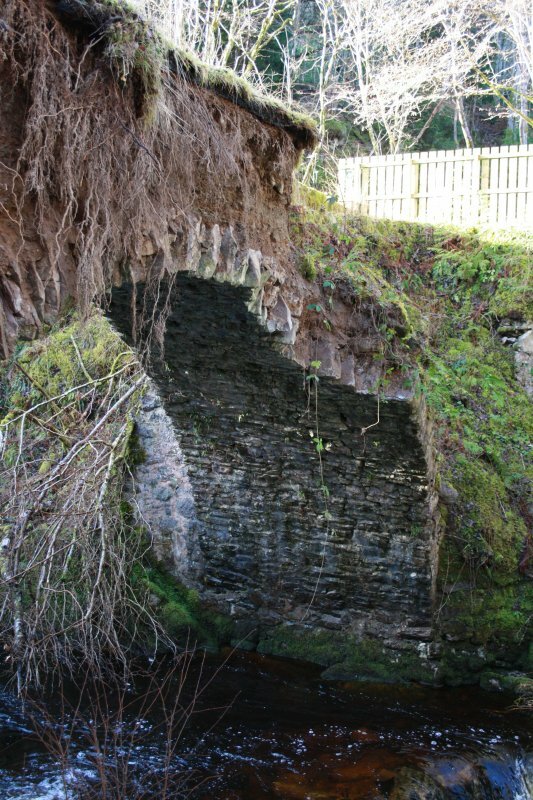 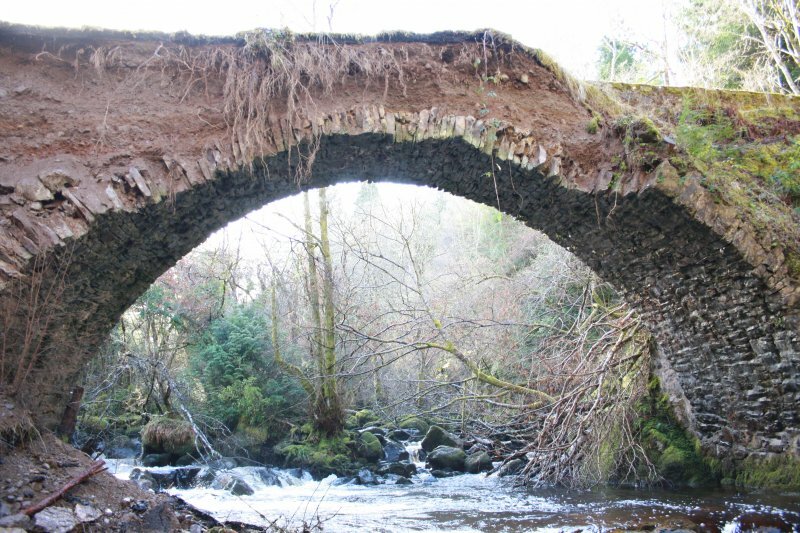 Inverfarigaig Bridge is a single span stone bridge, which was built in 1732. 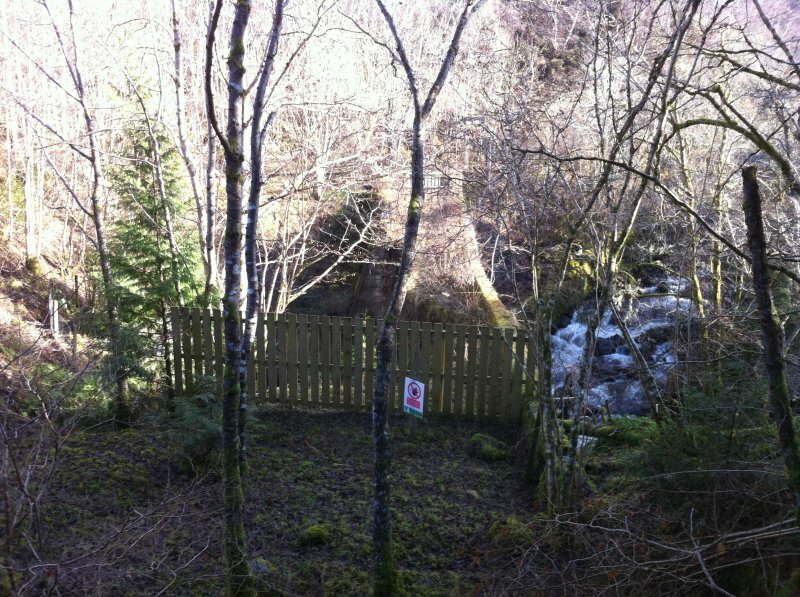 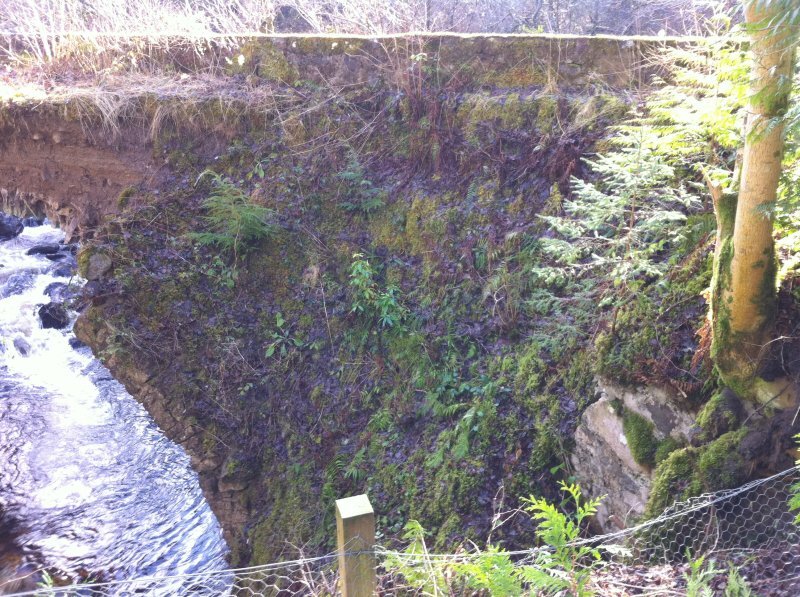 It has now been fenced off as it is in a very unstable condition. 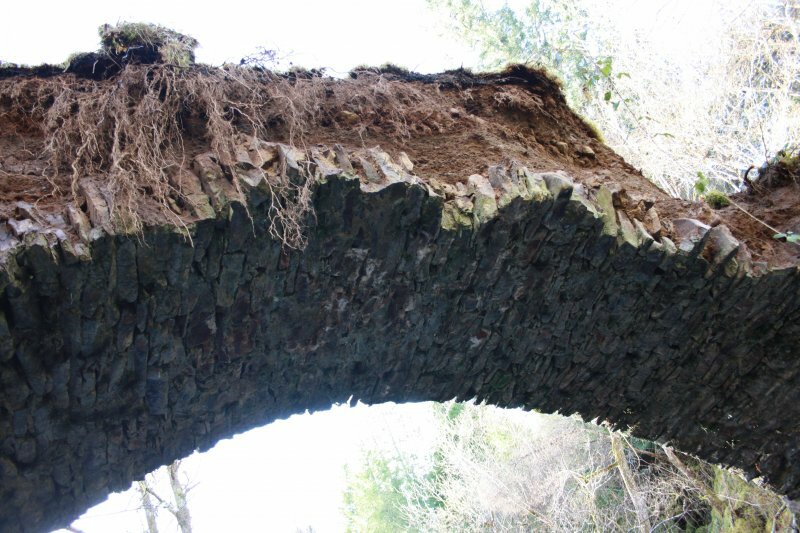 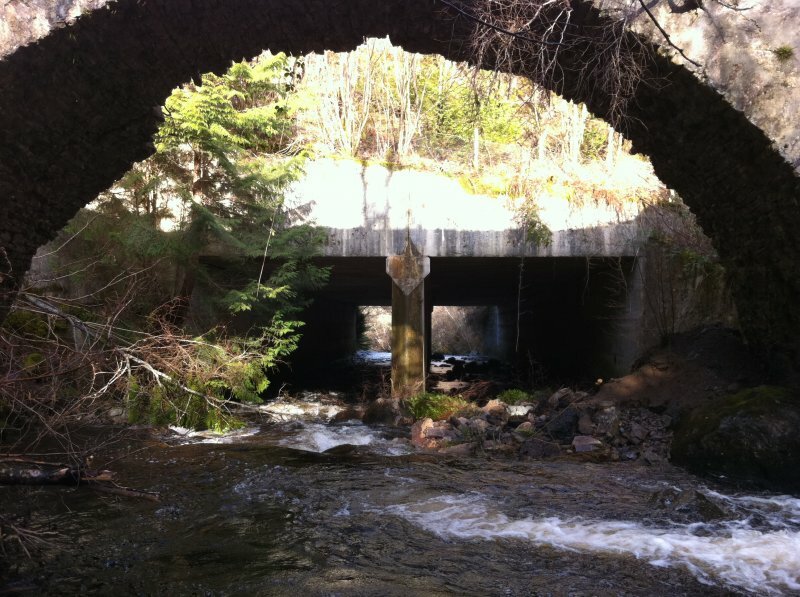 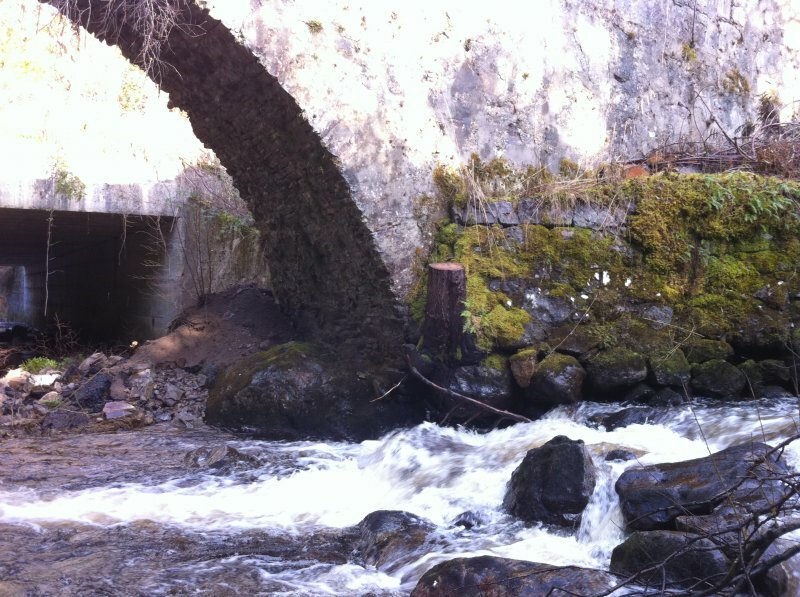 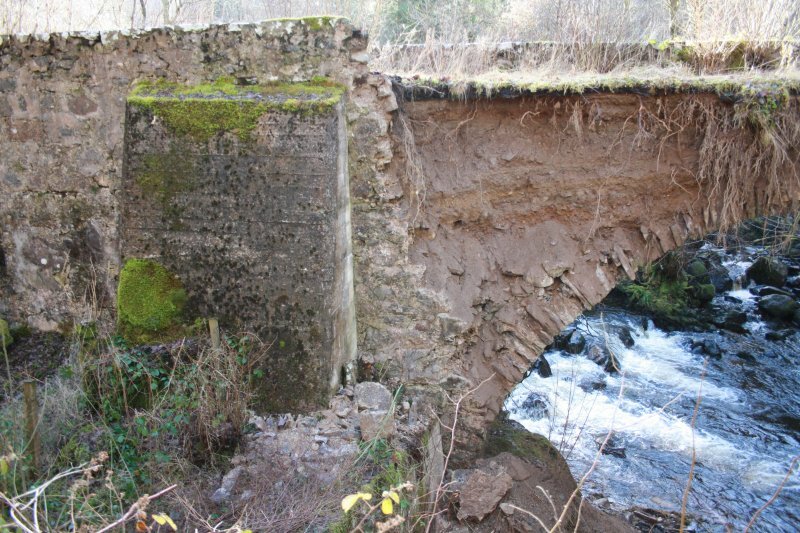 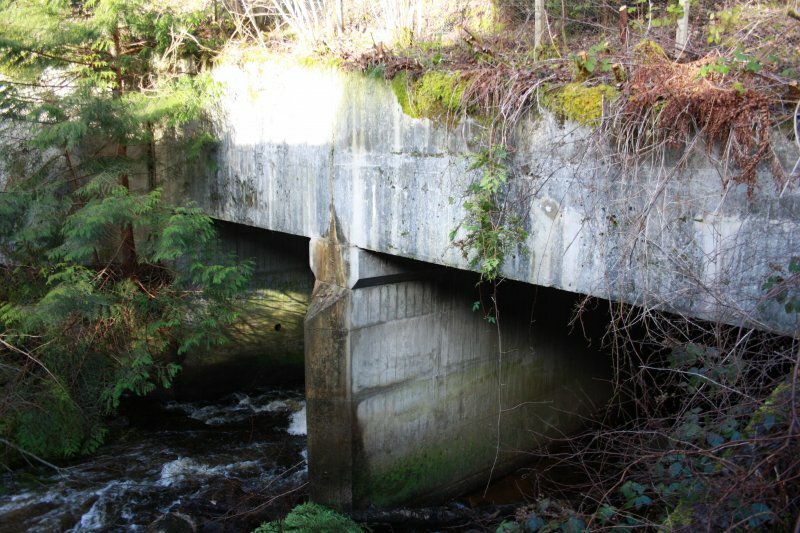 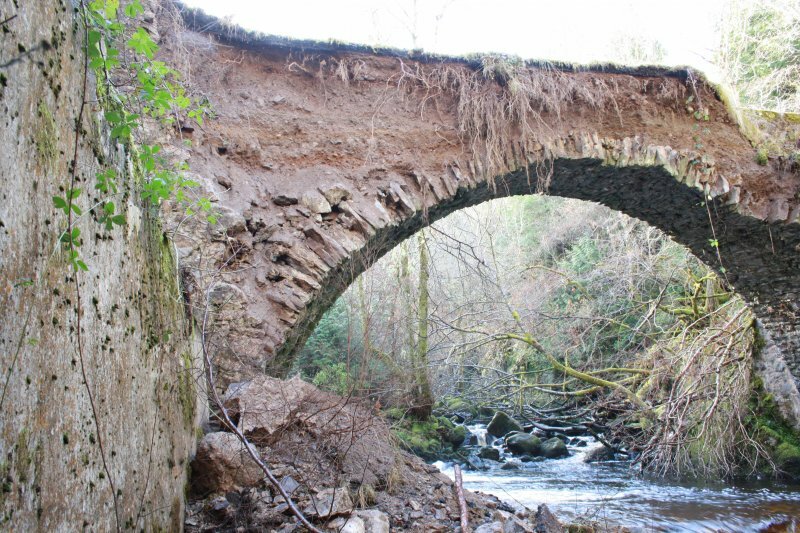 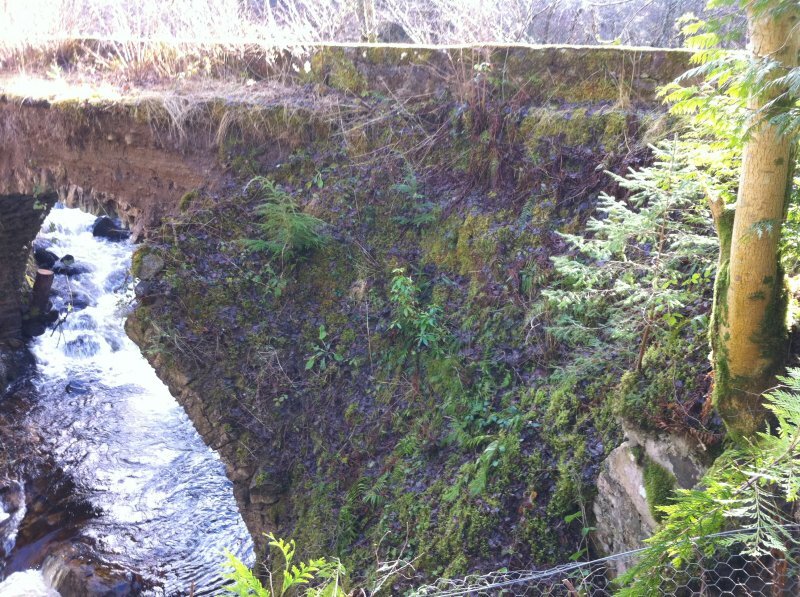 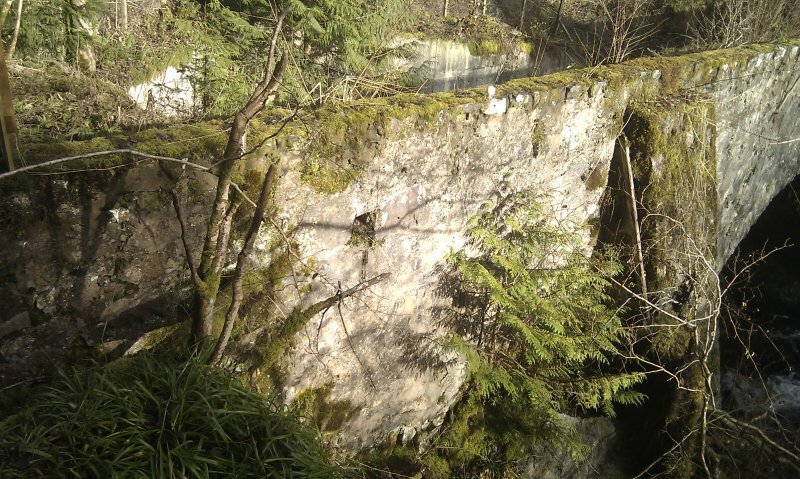 Only the arch ring and the bridge abutment remain where the SW side of the bridge has collapsed. 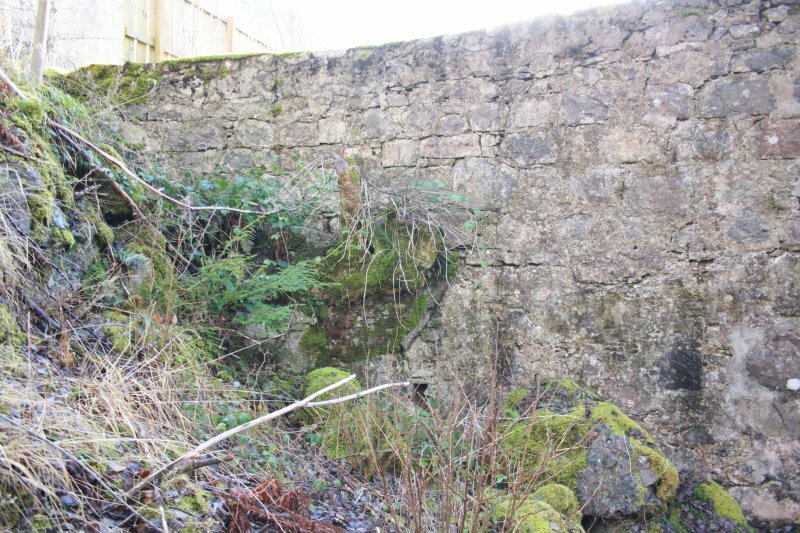 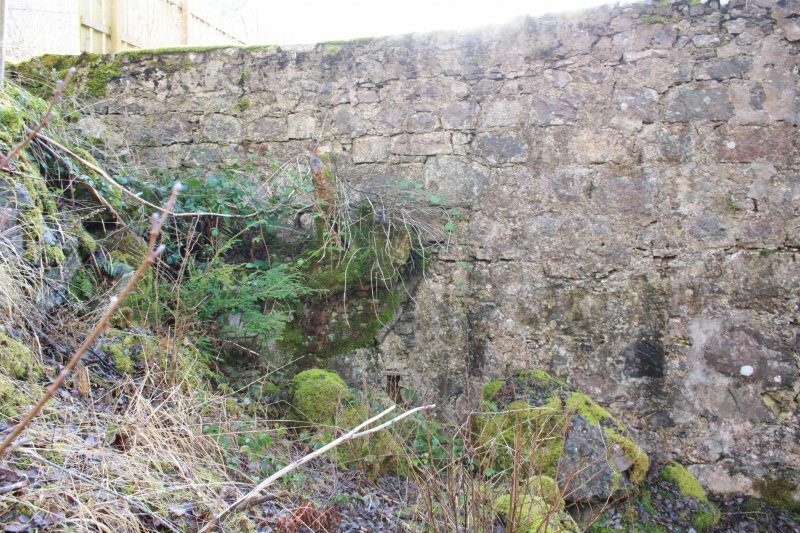 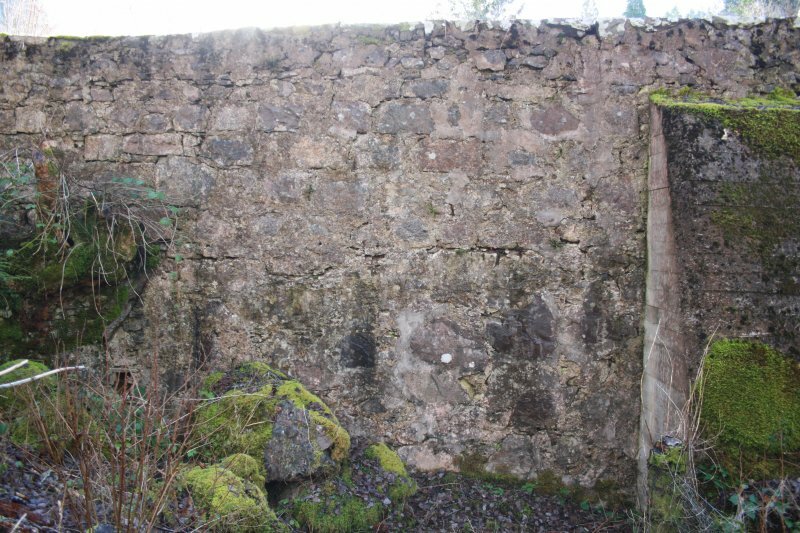 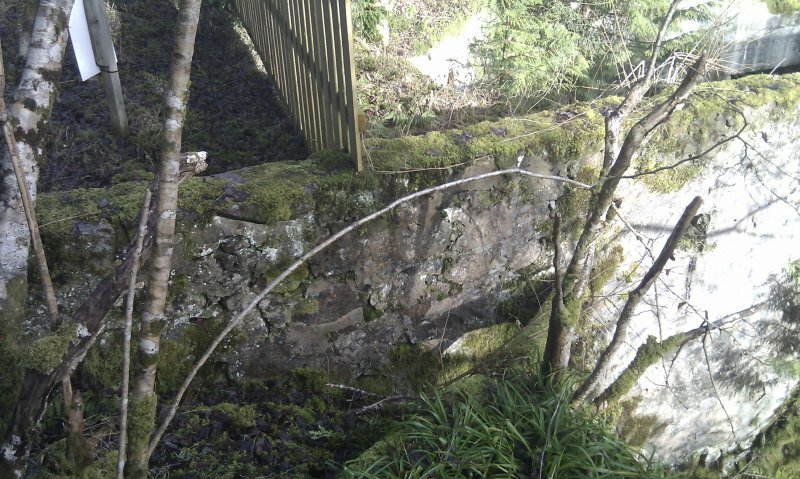 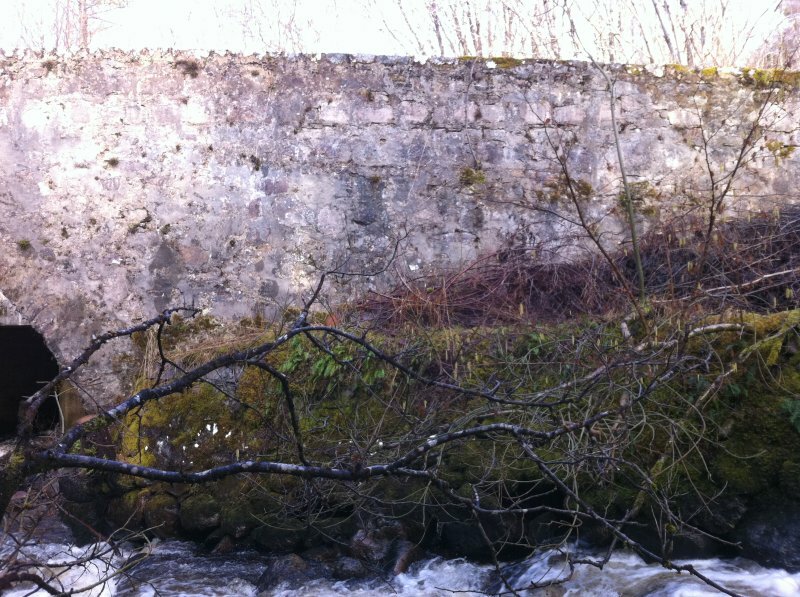 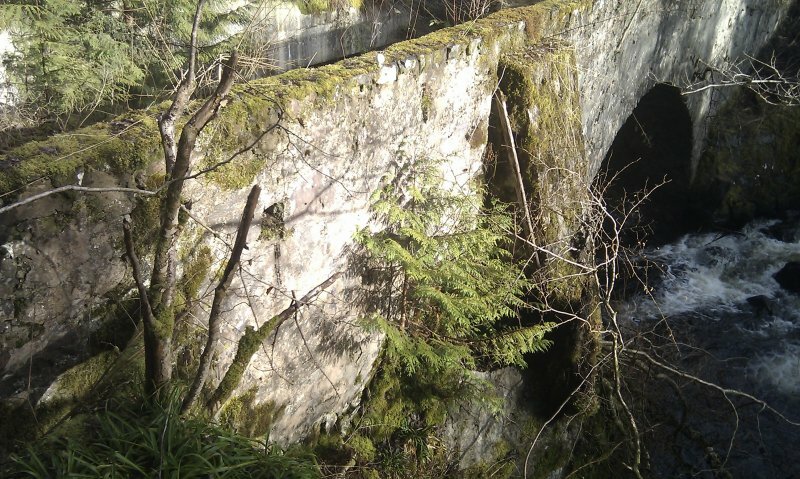 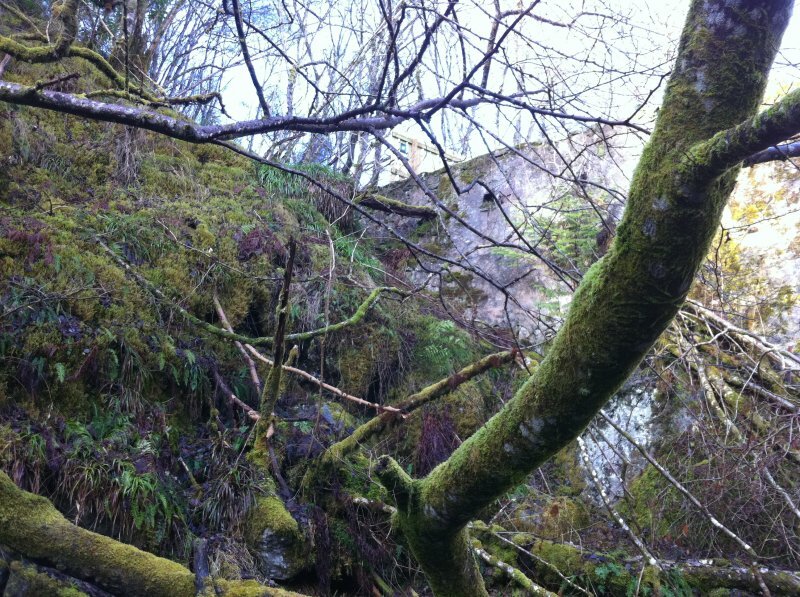 There are loose and cracked sections of stone in other parts and vegetation is to be seen growing between the stones. 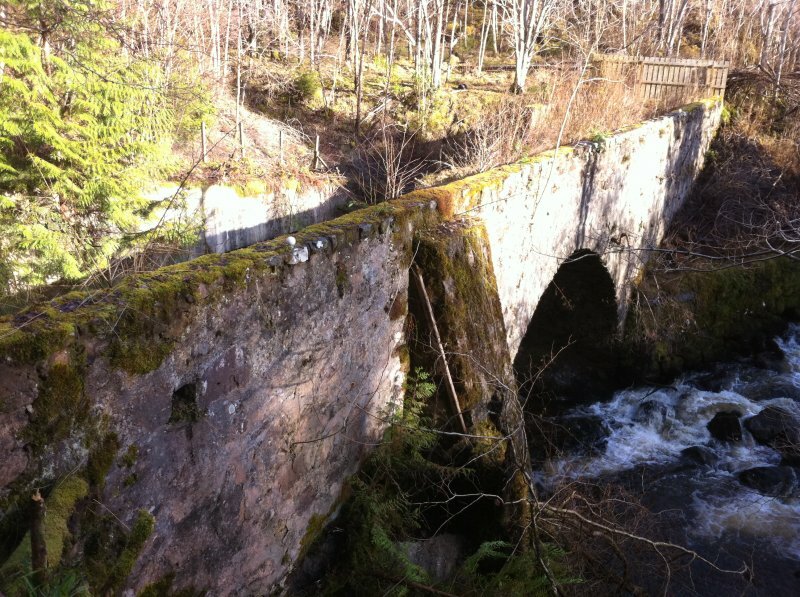 M Logie (Highland Council) 1997; NMRS, MS/1007/3. 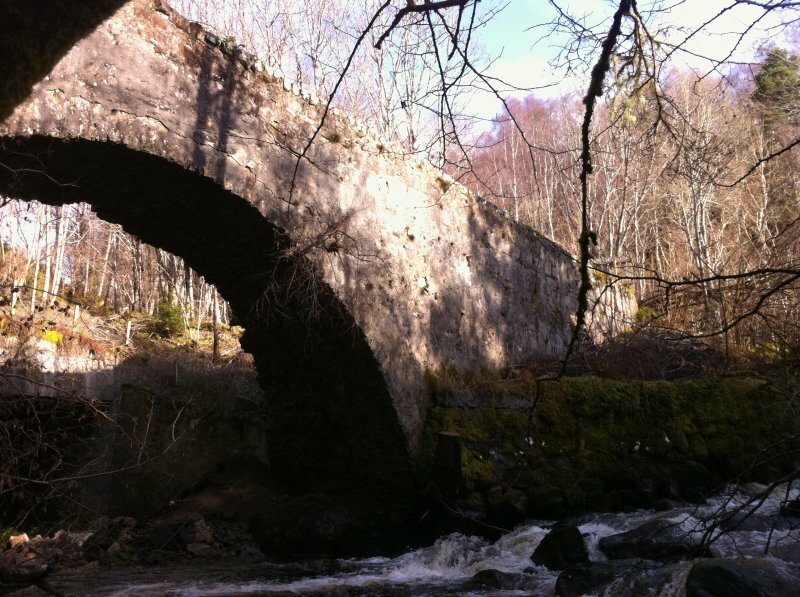 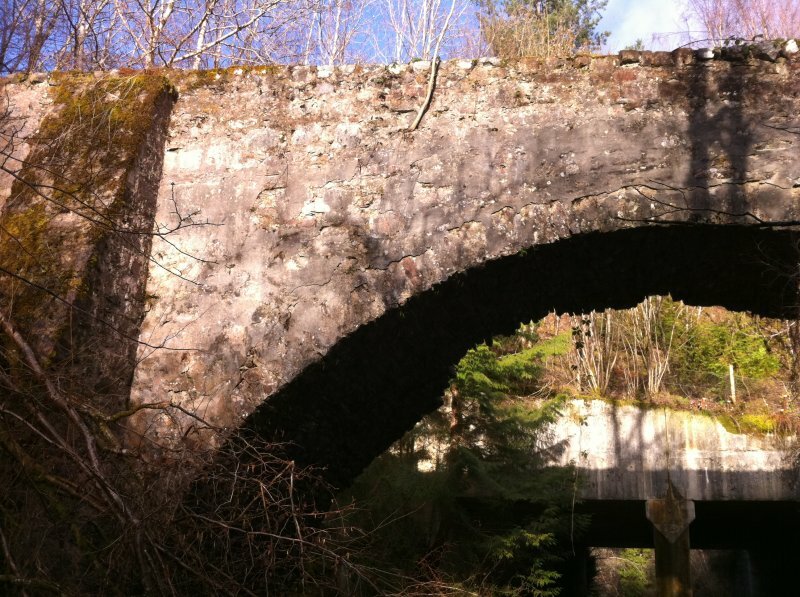 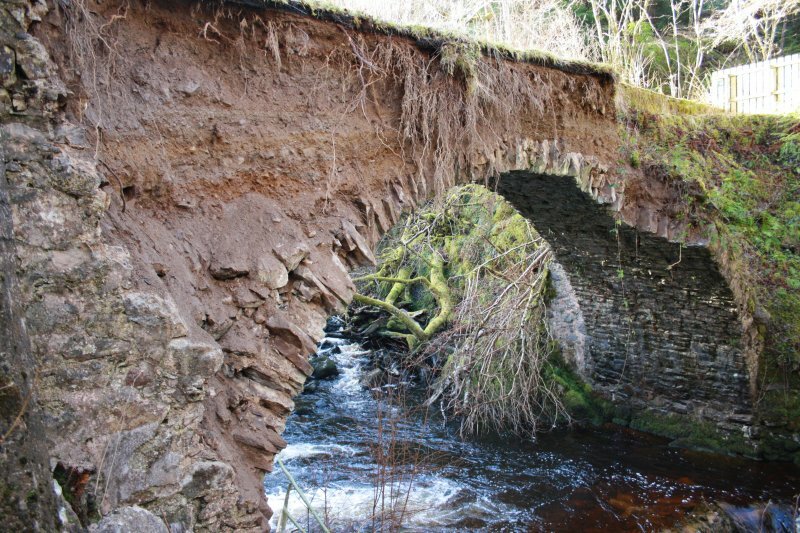 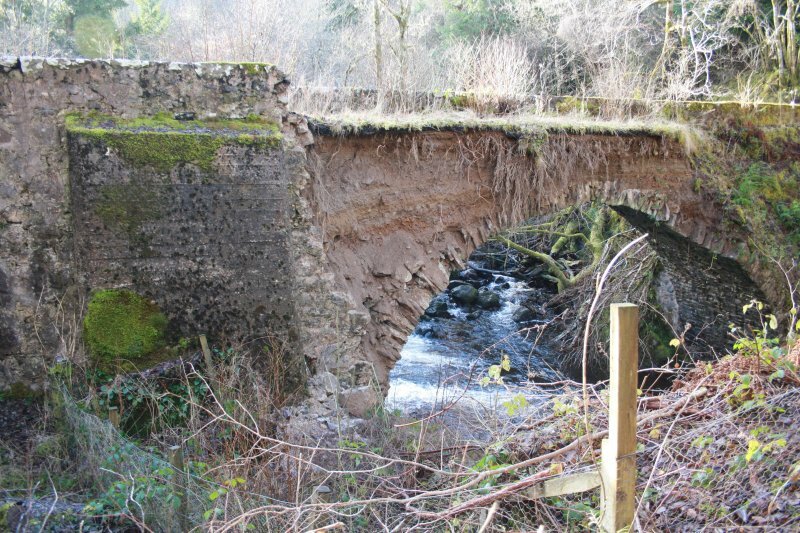 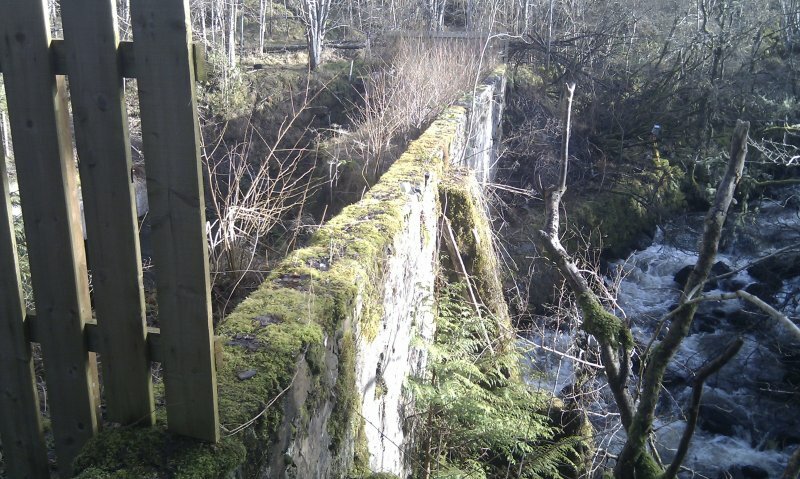 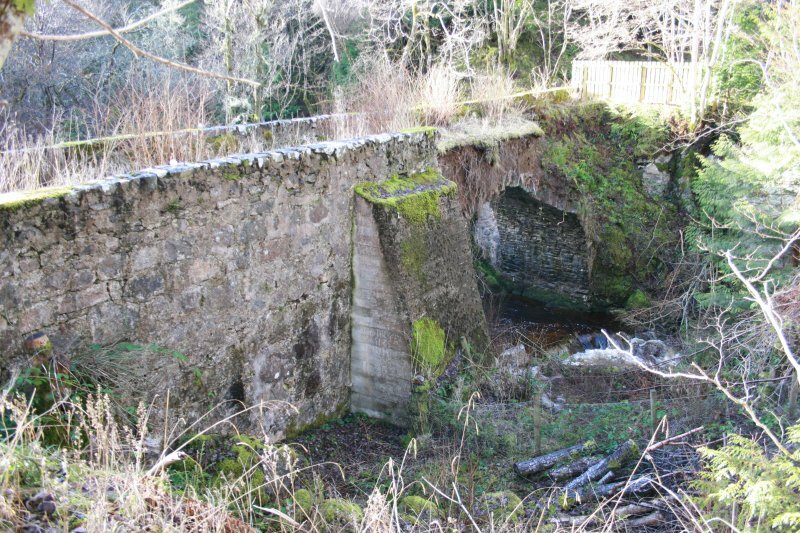 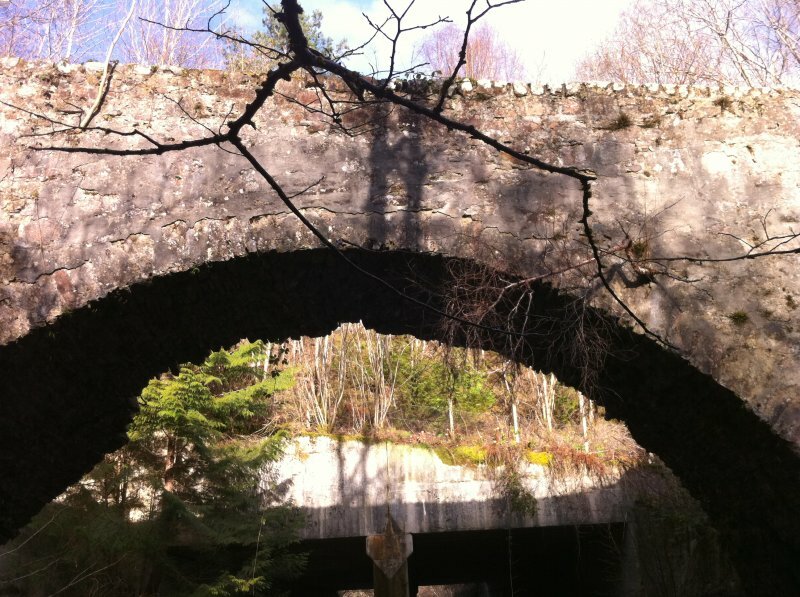 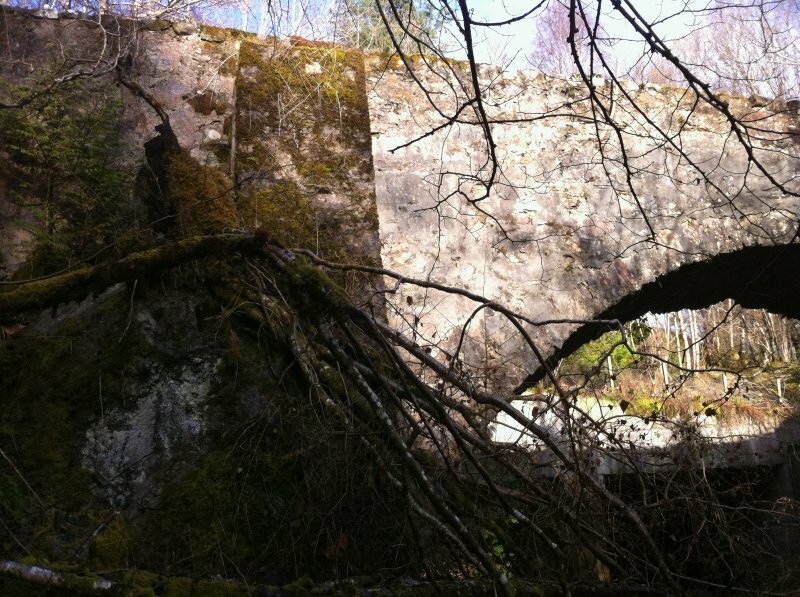 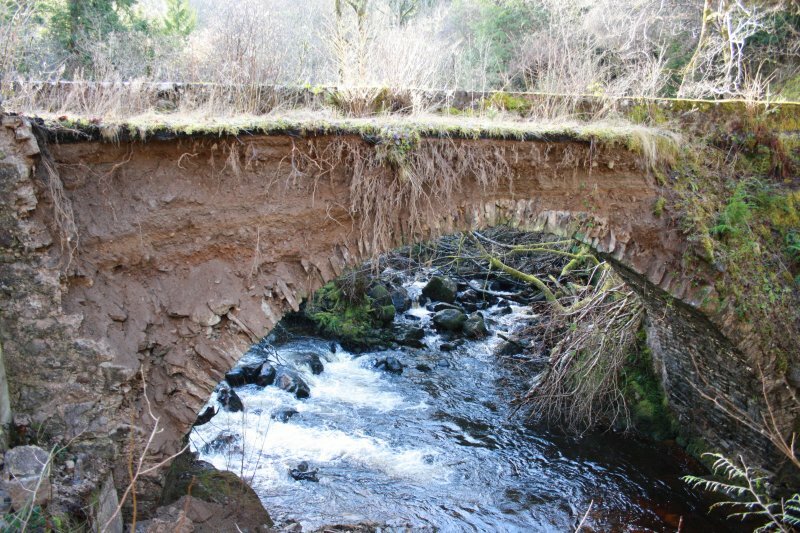 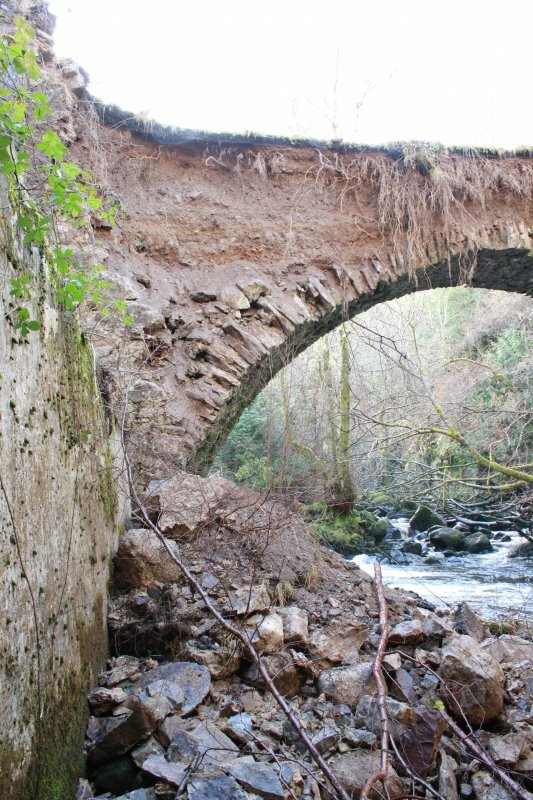 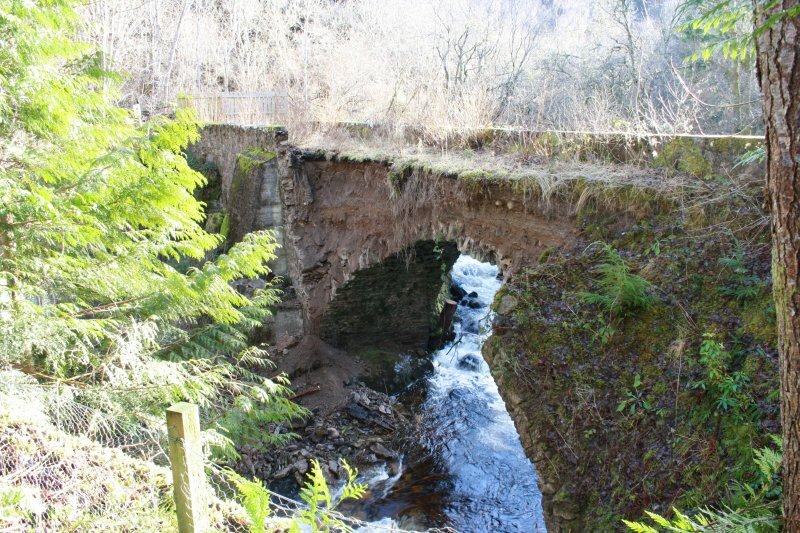 This bridge carries the former line of the B852 public road (Military road NMRS MR 1 or NH52SW 11.00) over the River Farigaig a short distance above its debouchement into Loch Ness and to the SE of its successor and present bridge (NH52SW 35). 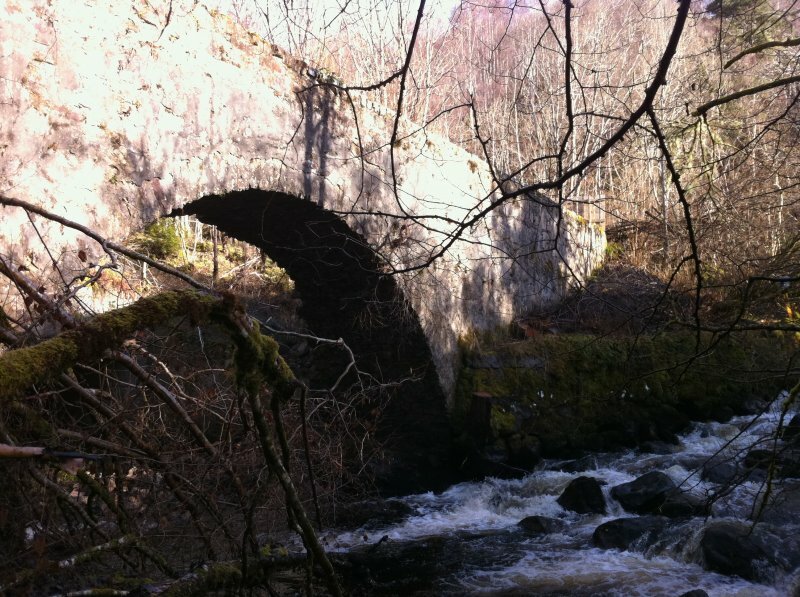 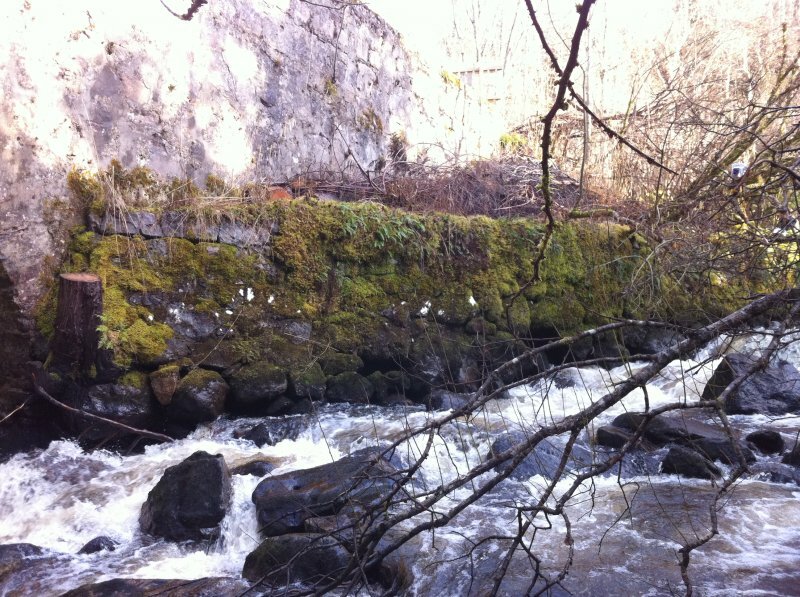 The river here forms the boundary between the parishes of Boleskine and Abertarff (to the SW) and Dores (to the NE). 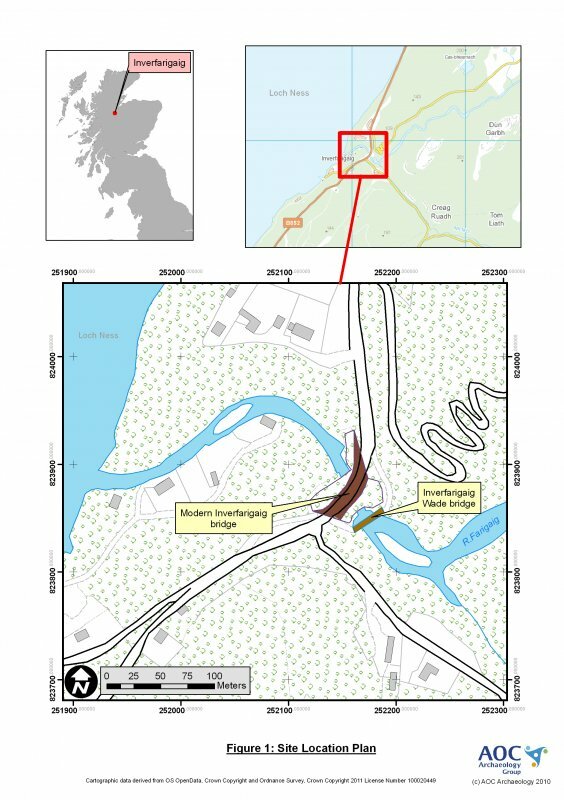 Information from RCAHMS (RJCM), 18 December 2000. 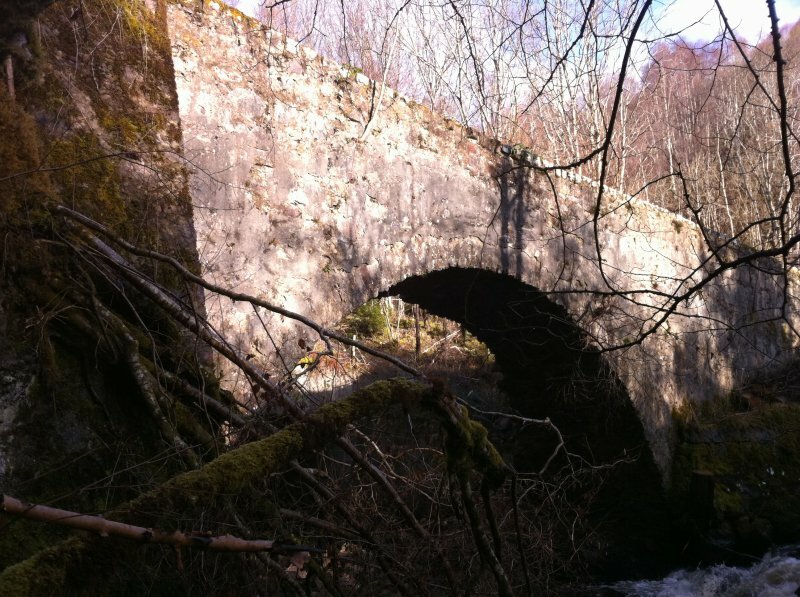 Built on route of General George Wade’s Great Glen road. 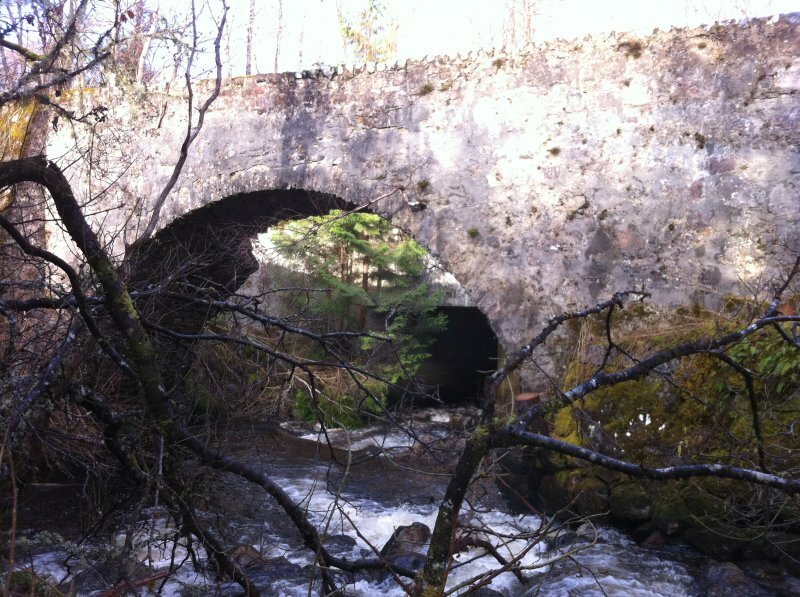 Inverfarigaig Bridge carried the road connecting the military garrisons at Inverness and Fort Augustus. 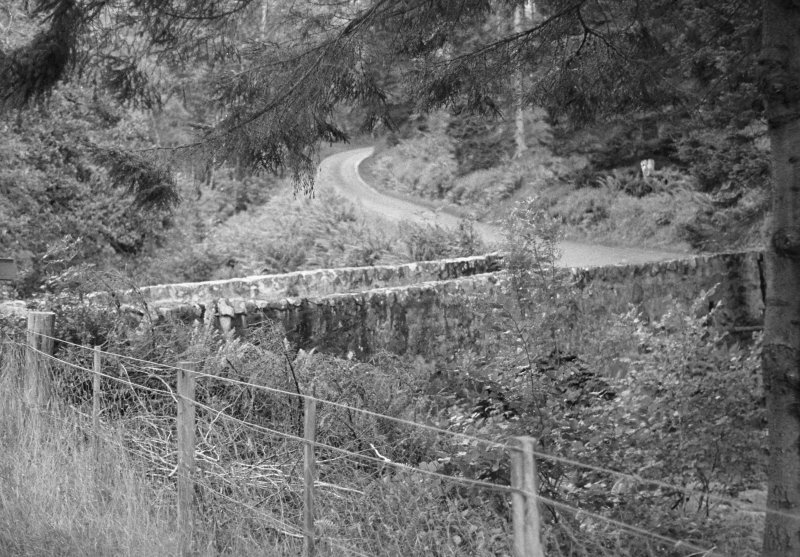 concrete bridge in the 1960s. 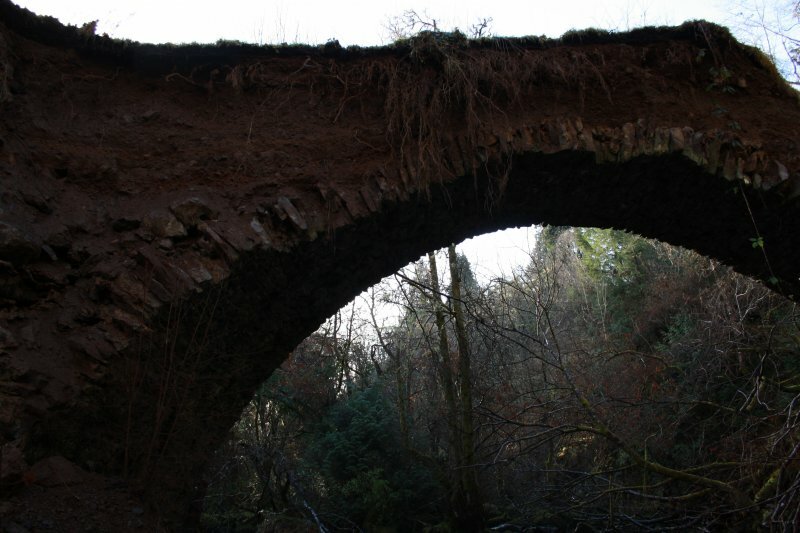 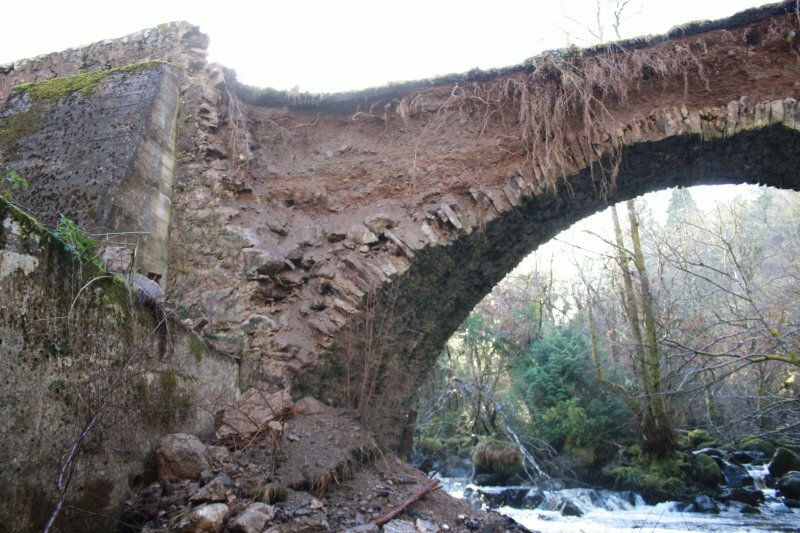 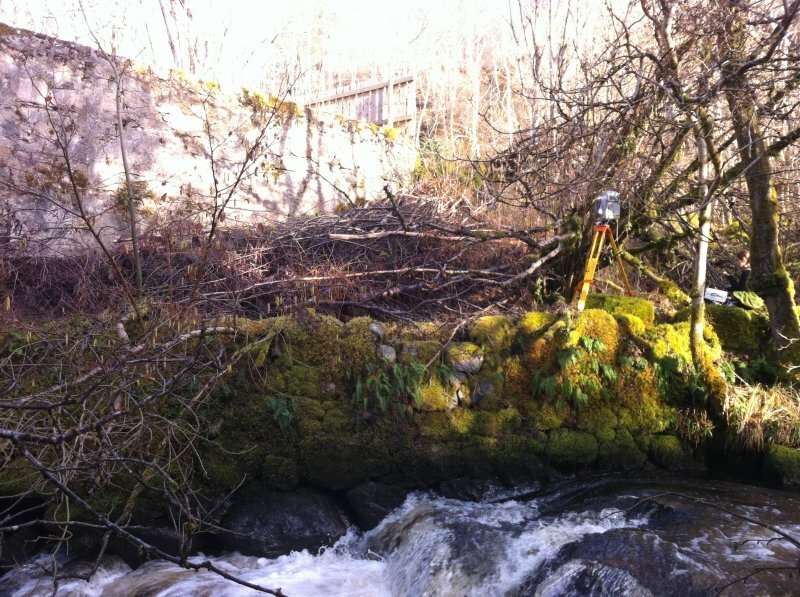 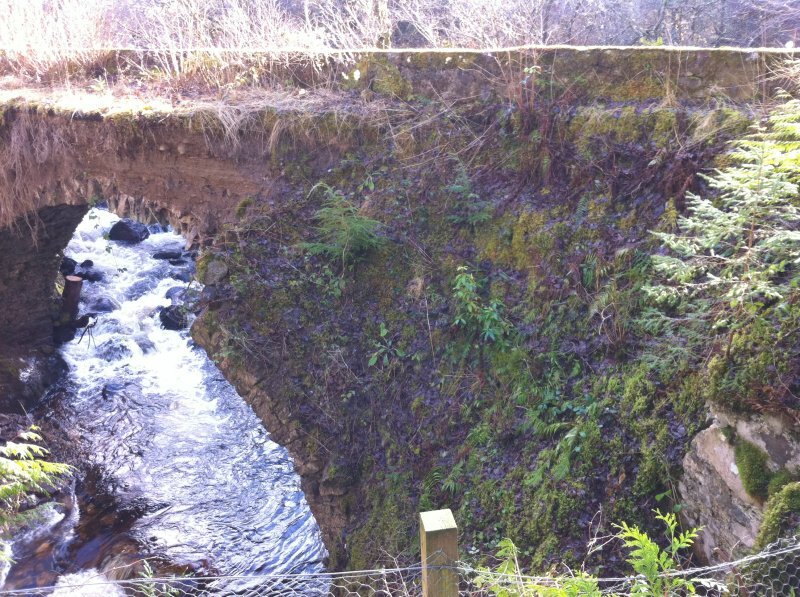 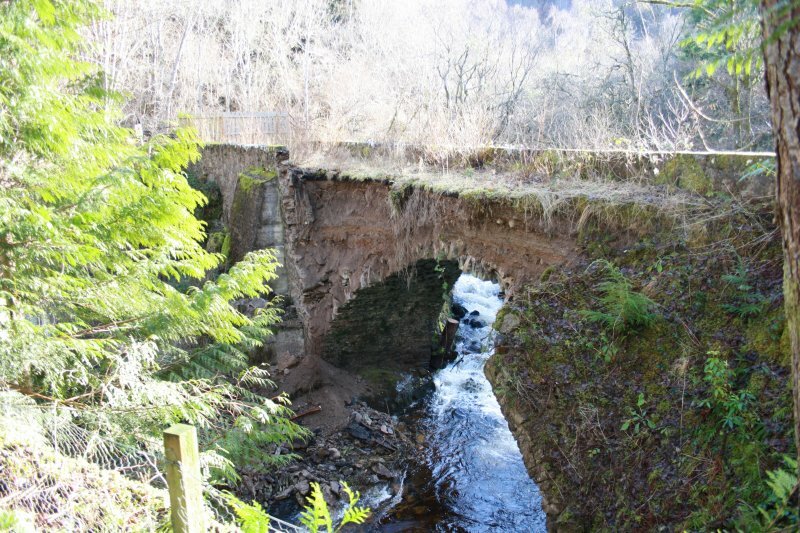 NH 52175 23849 An emergency laser scan survey was undertaken 28 February–1 March 2011 on Inverfarigaig Bridge, following the collapse of a large section of the Wade bridge in the winter of 2011. 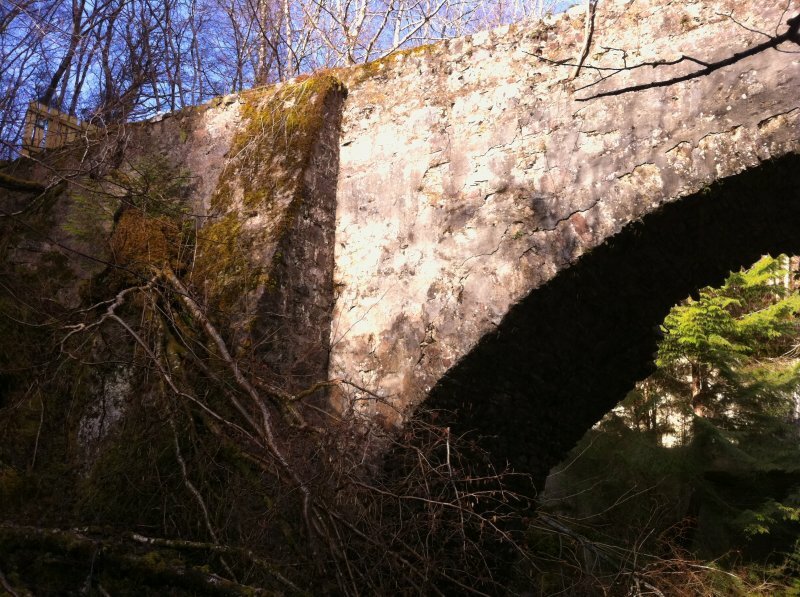 The bridge was scanned and CAD elevations and a plan produced.